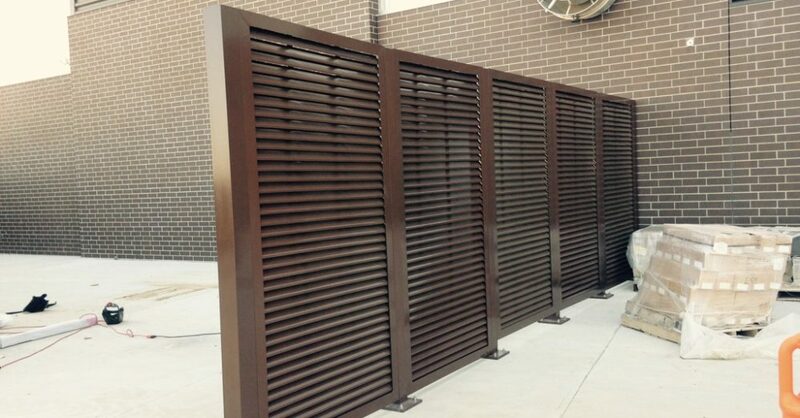 PalmSHIELD is the perfect architectural feature for today's contemporary construction. 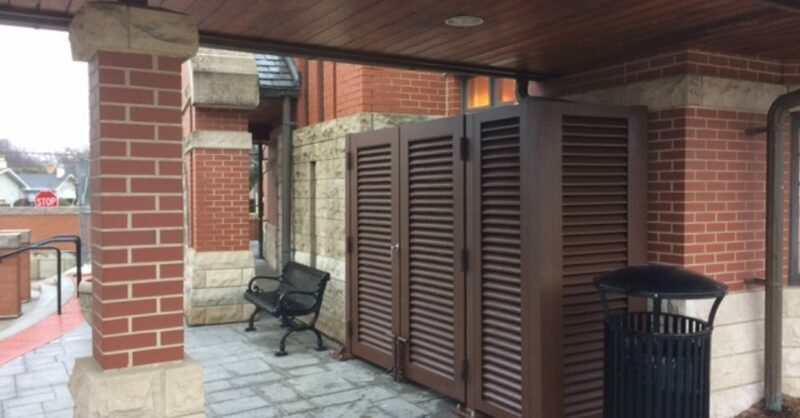 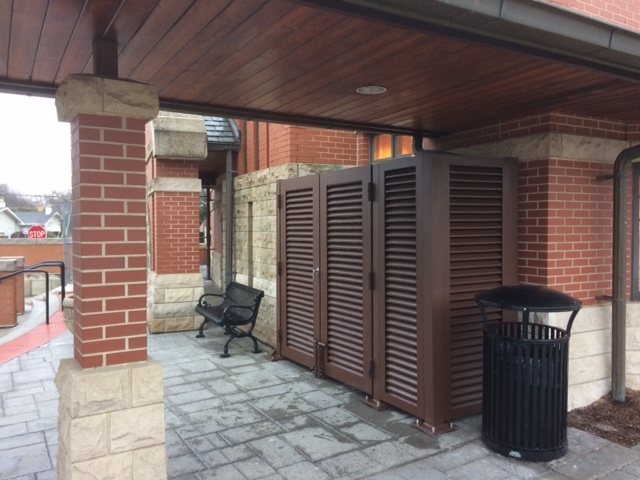 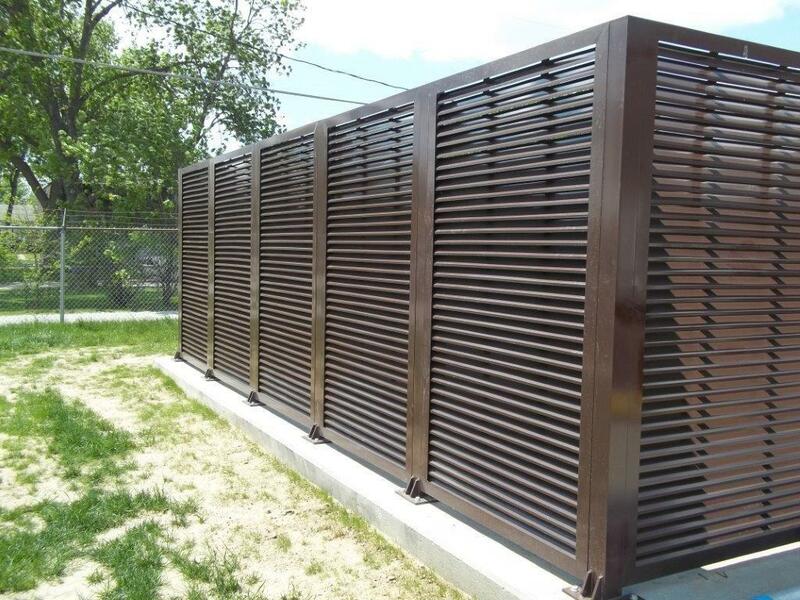 A great louvered equipment enclosure. 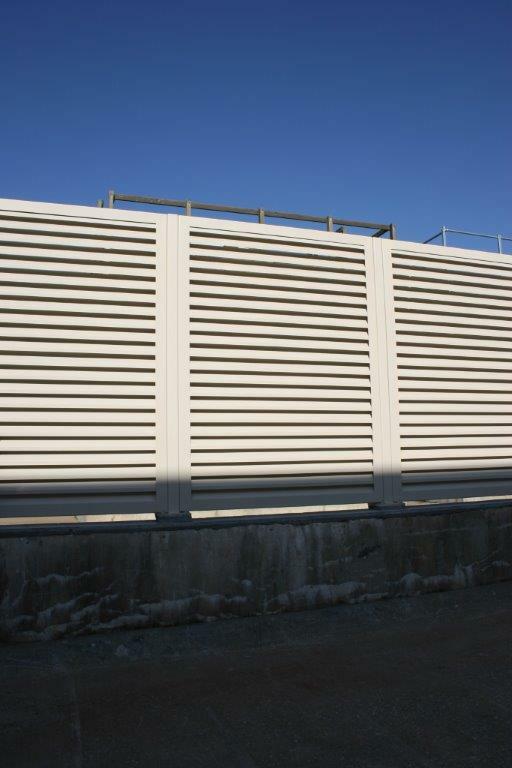 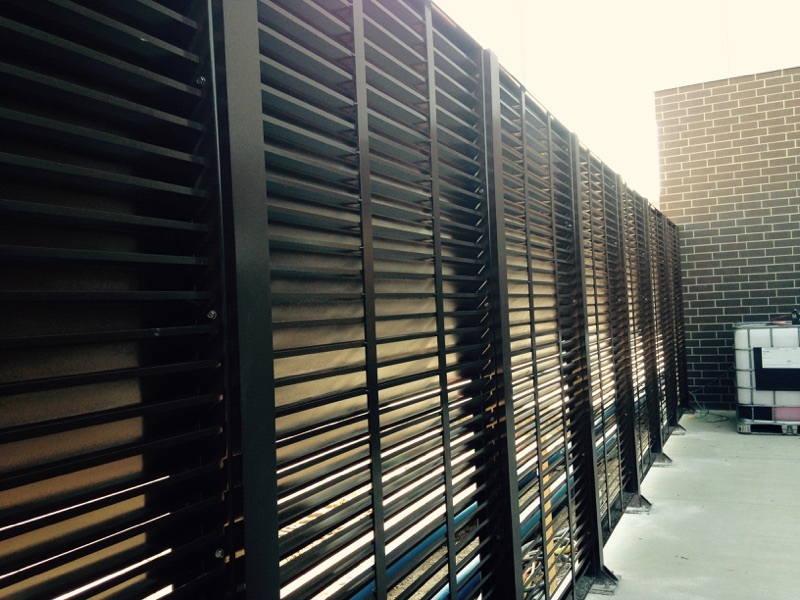 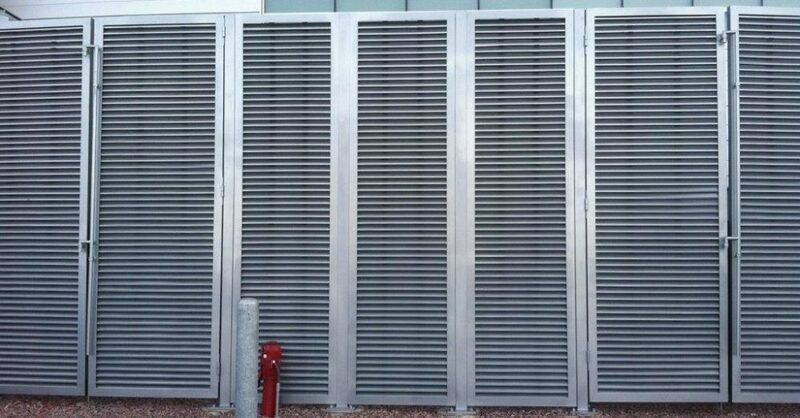 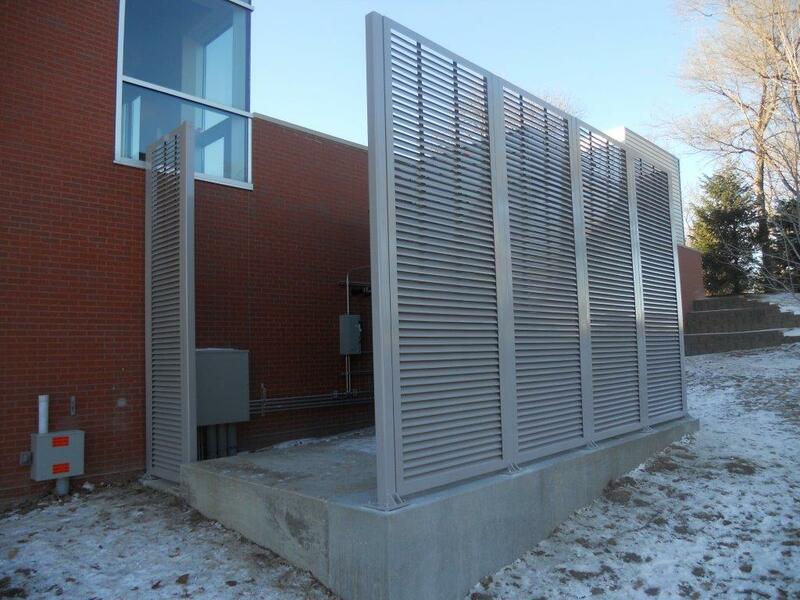 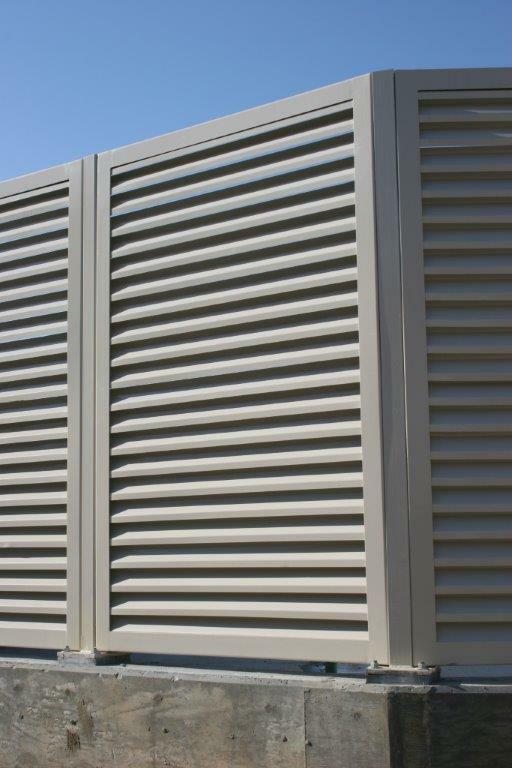 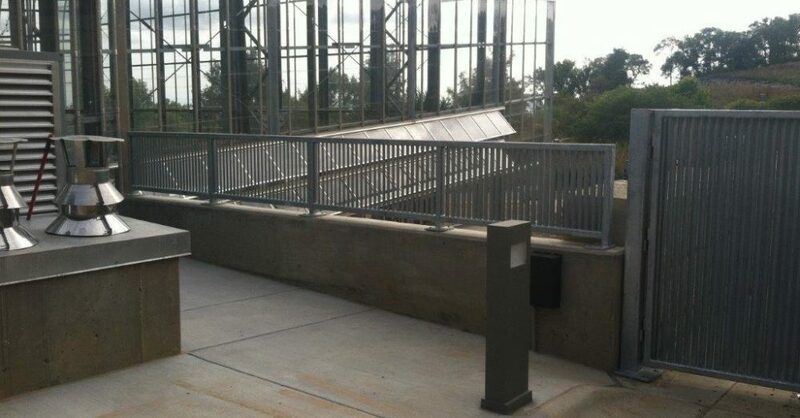 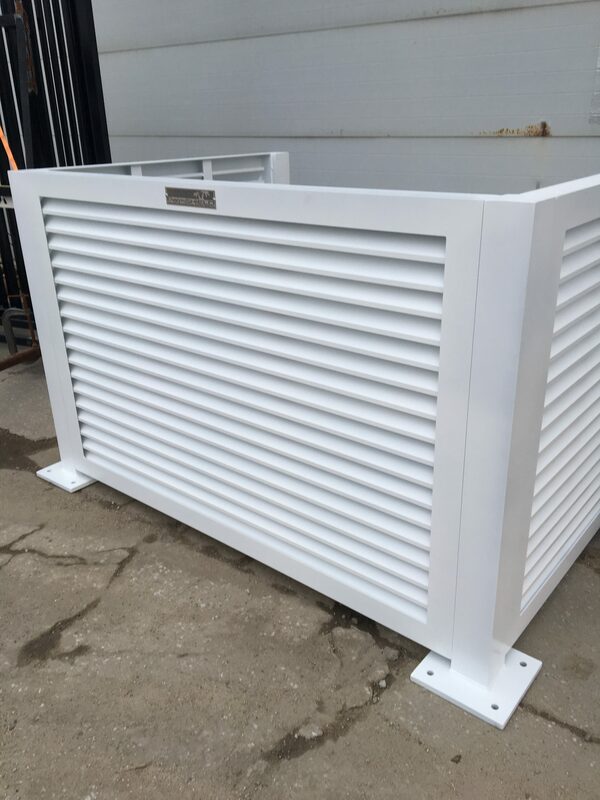 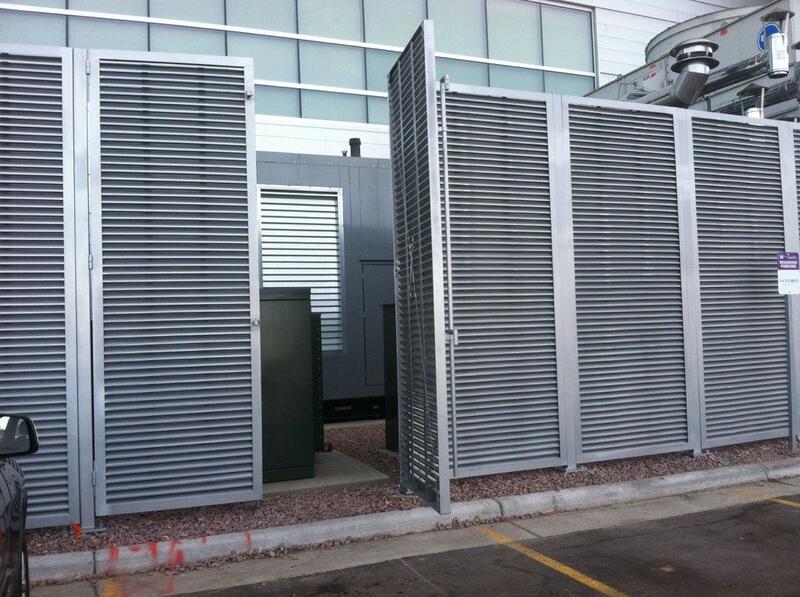 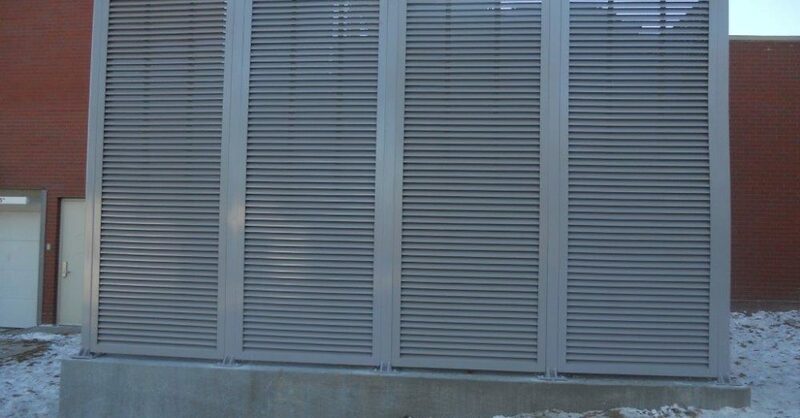 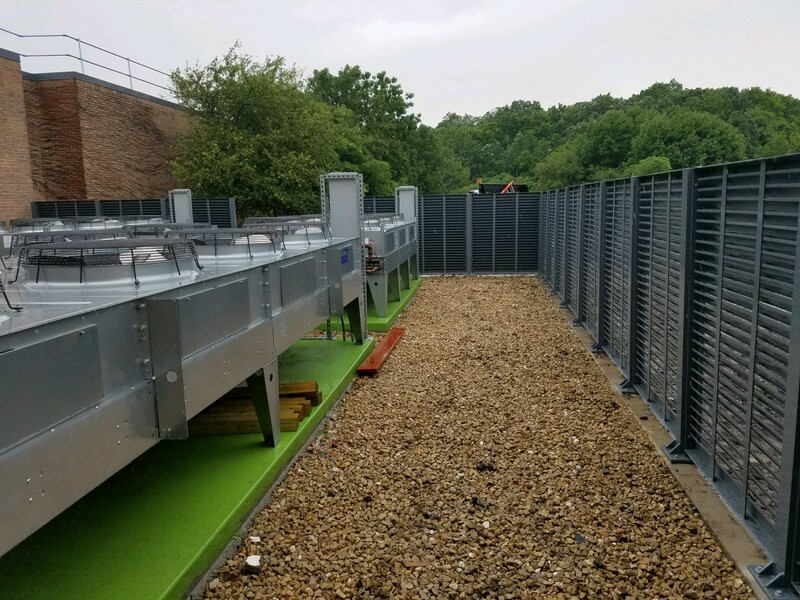 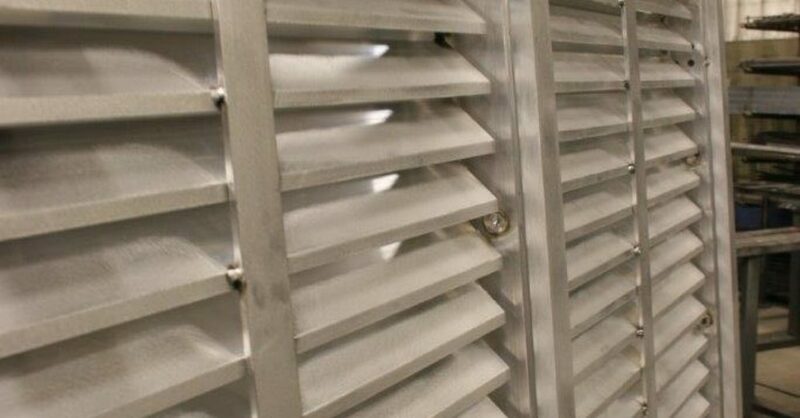 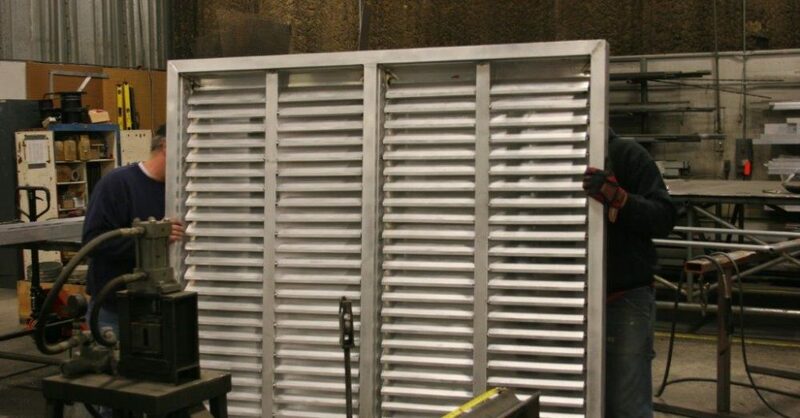 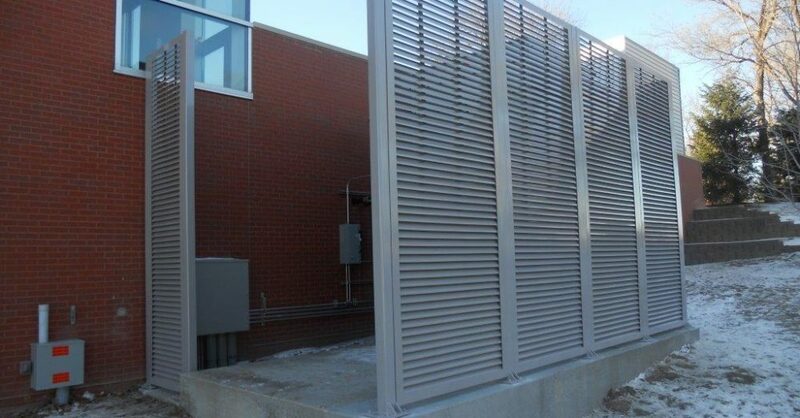 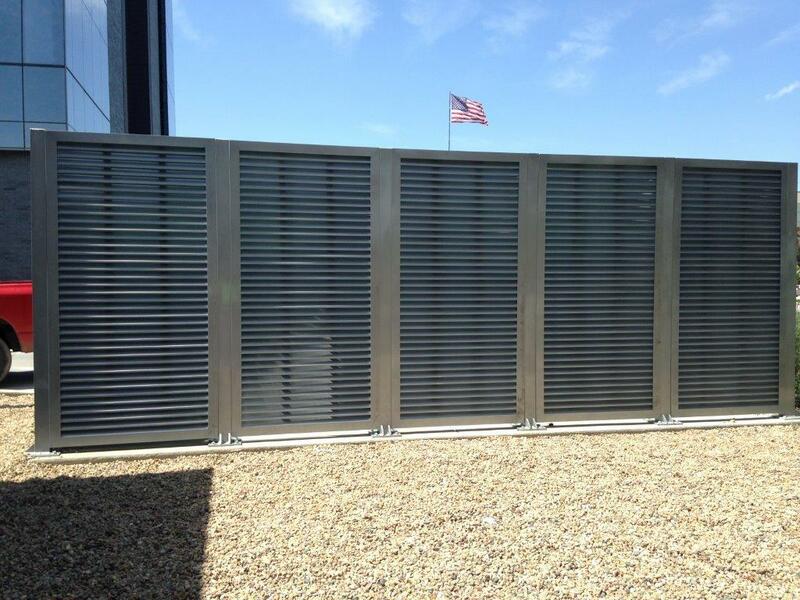 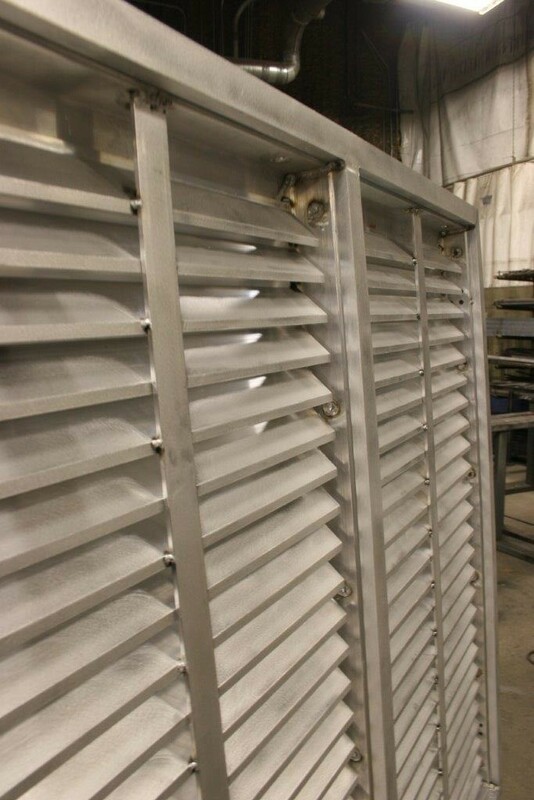 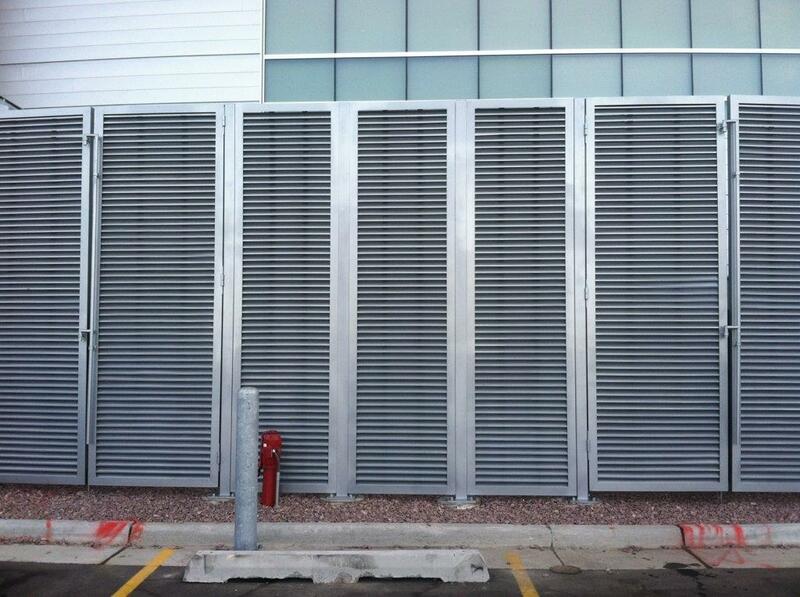 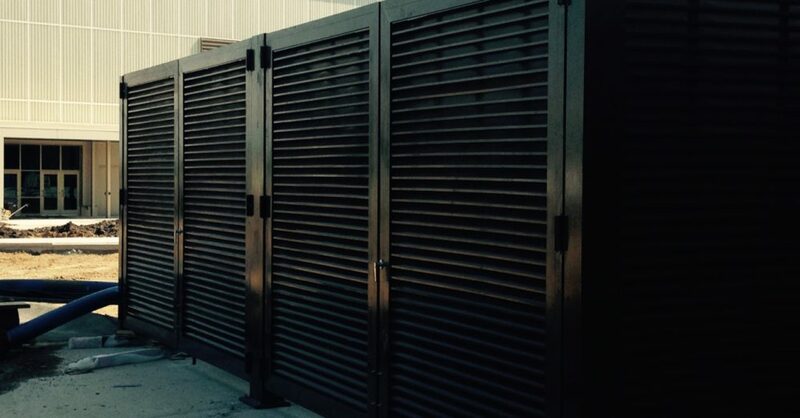 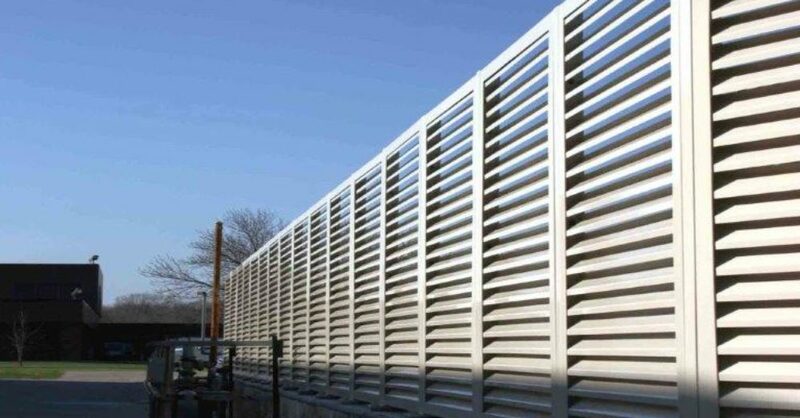 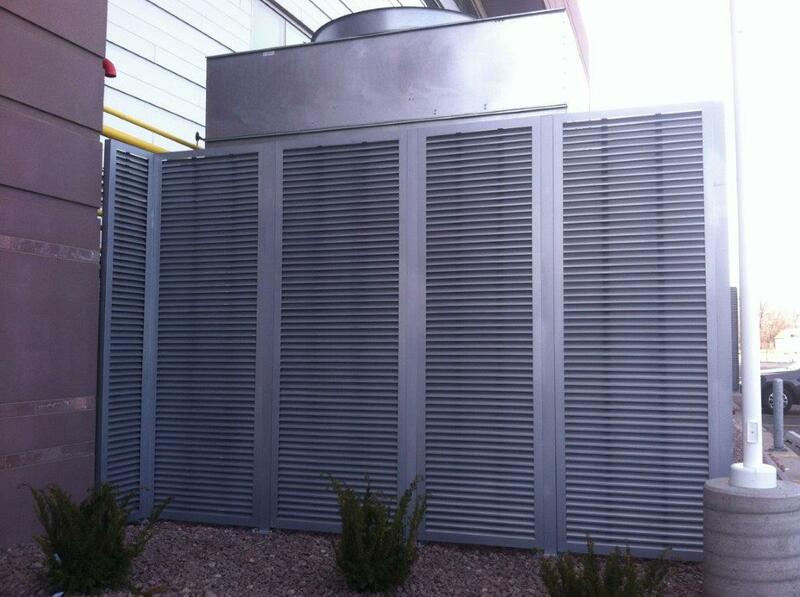 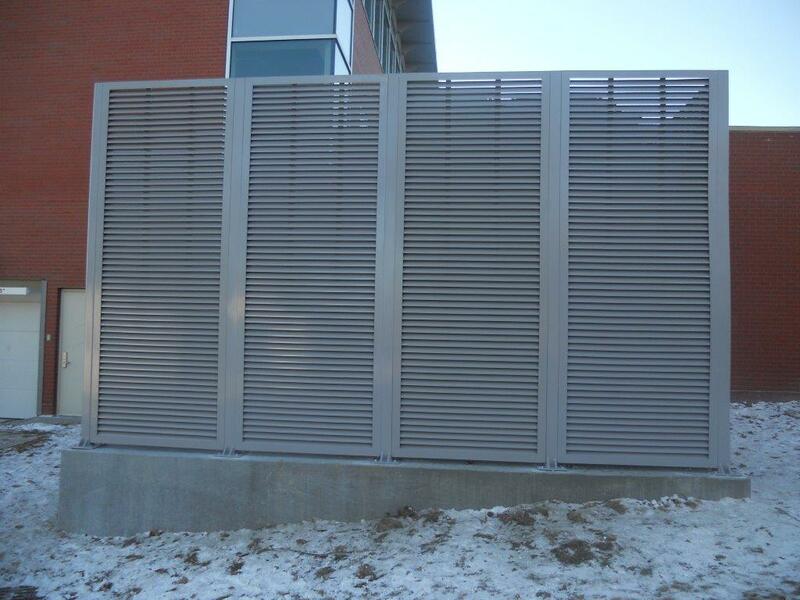 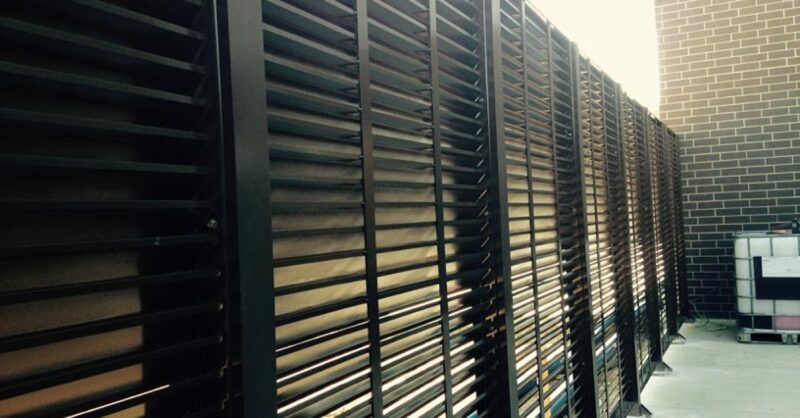 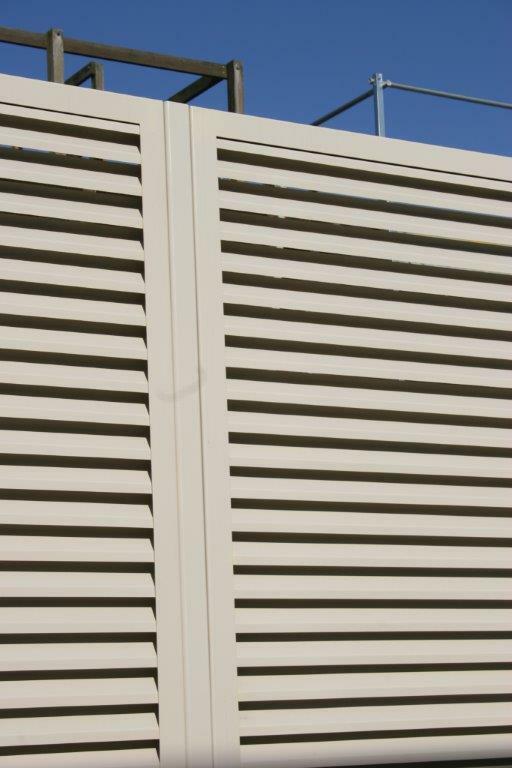 PalmSHIELD Louvers is the perfect solution for securing and screening mechanical equipment. 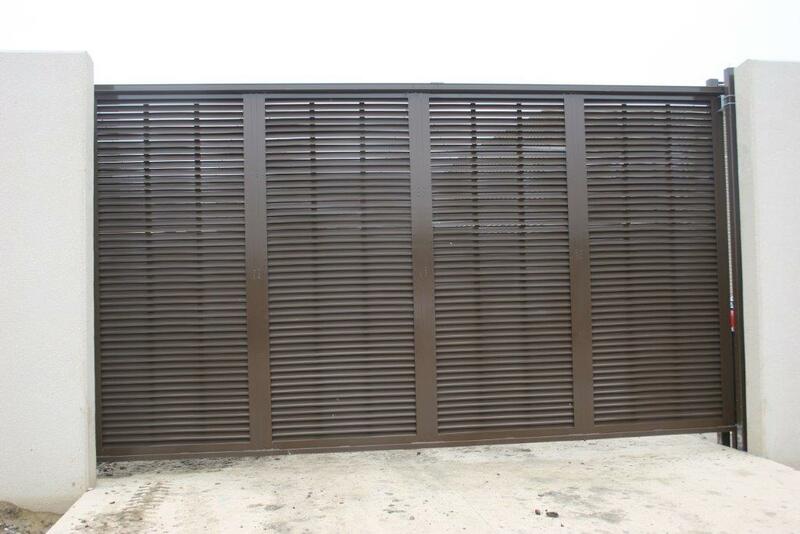 A great louvered equipment enclosure. 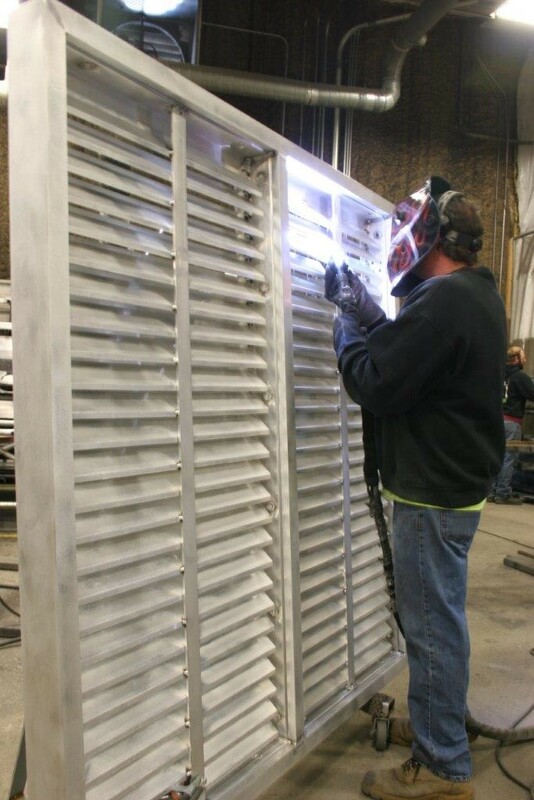 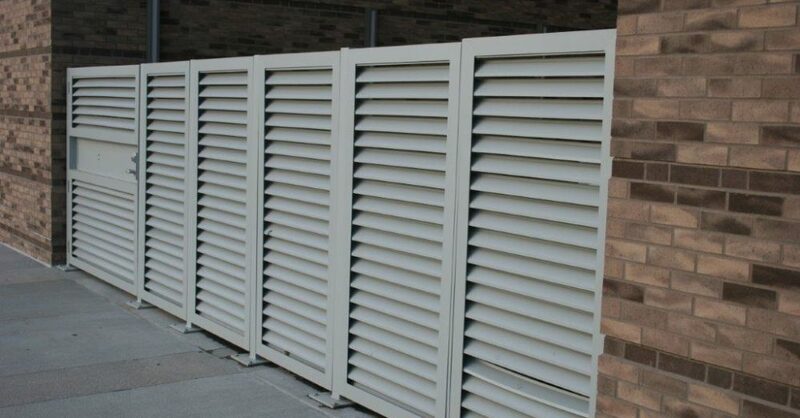 PalmSHIELD is a custom louver manufacturer. 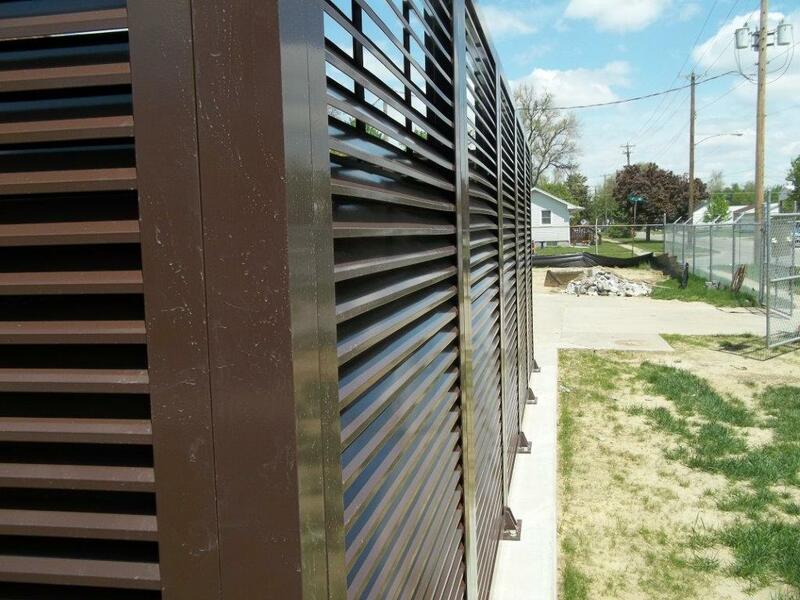 We love gabled panels! 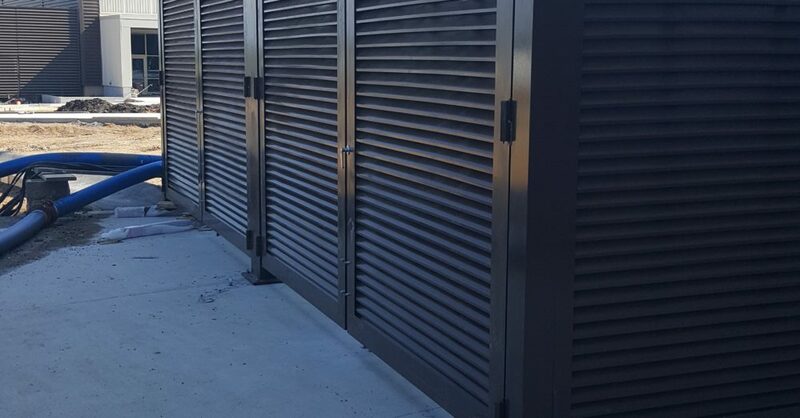 Compressors, air handlers, chillers, generators, transformers, emergency equipment, pumps and meters all should be secured and concealed from public access. 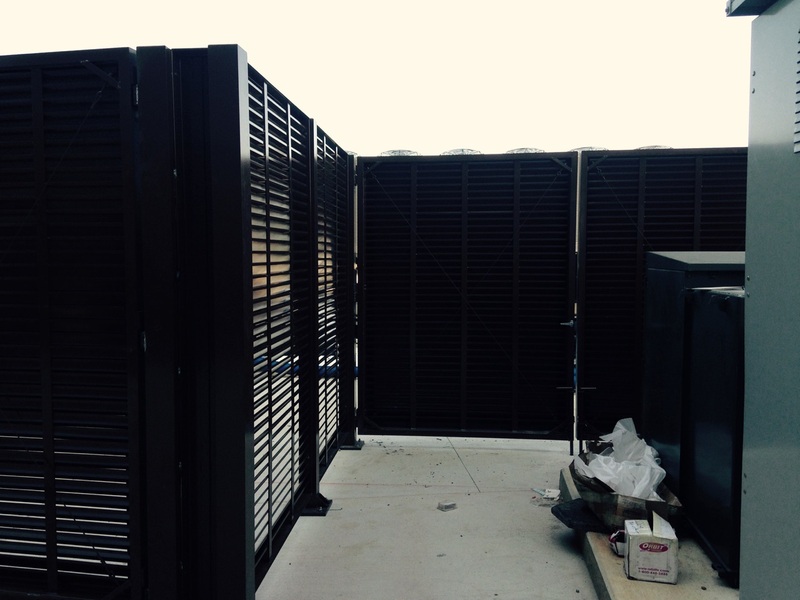 A great louvered equipment enclosure. 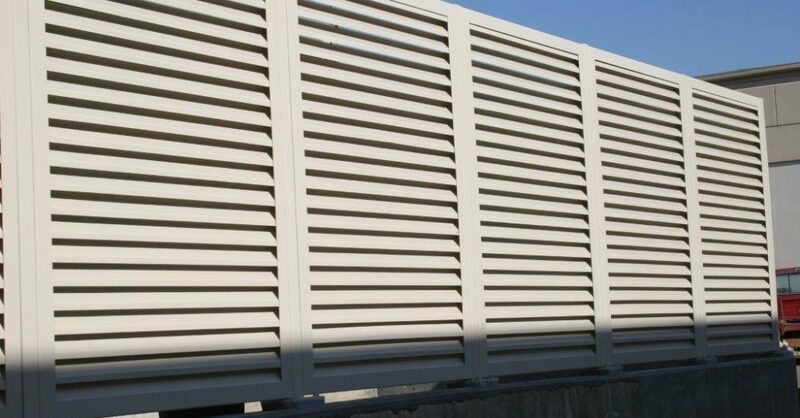 PalmSHIELD is your solution. 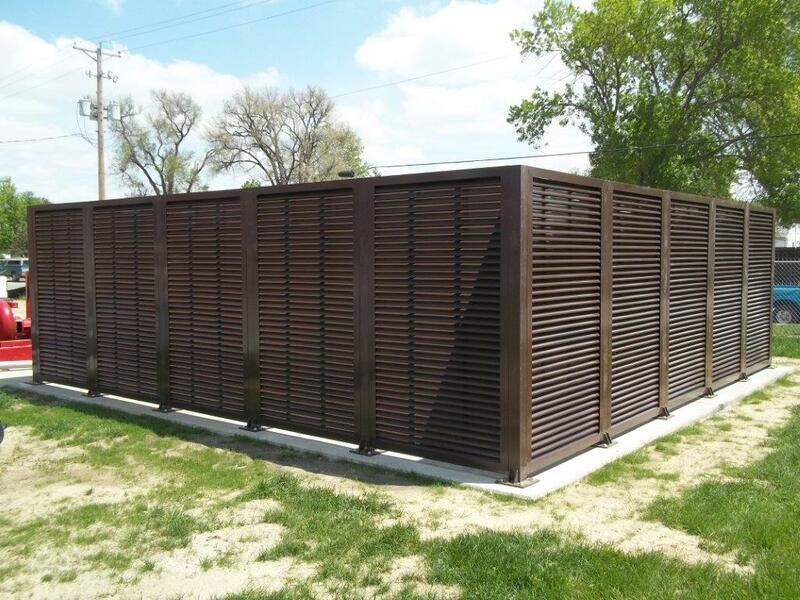 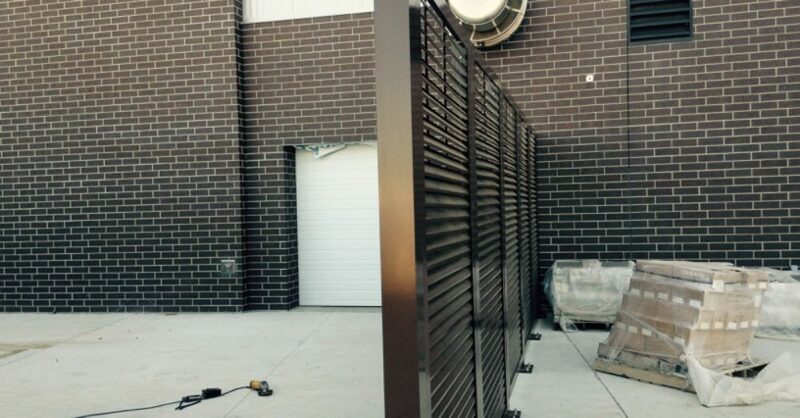 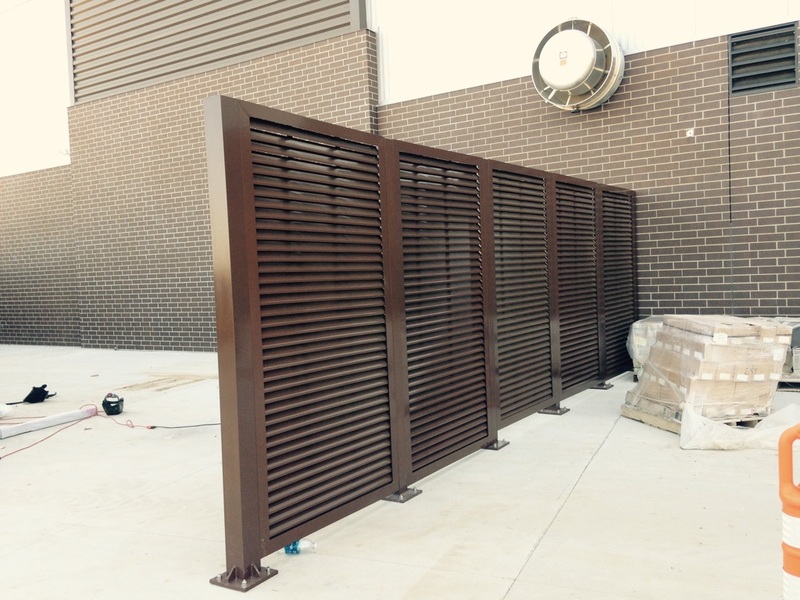 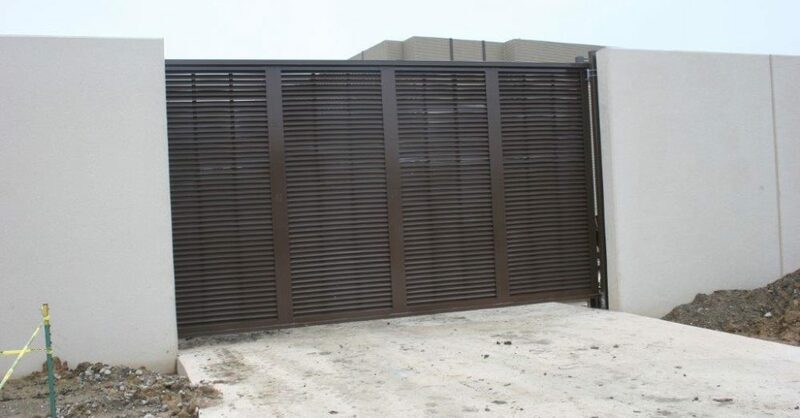 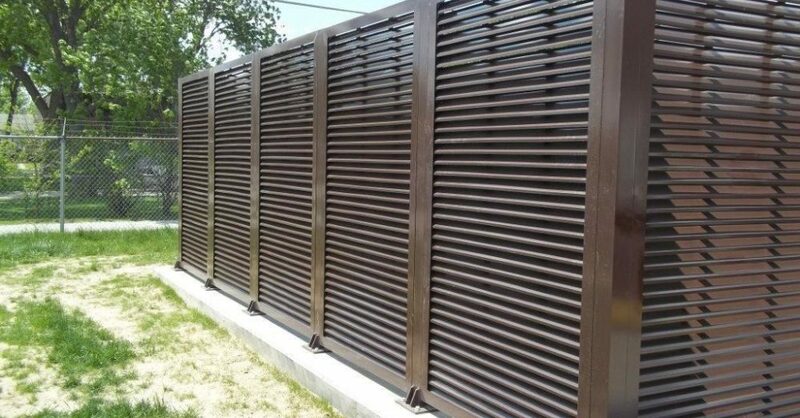 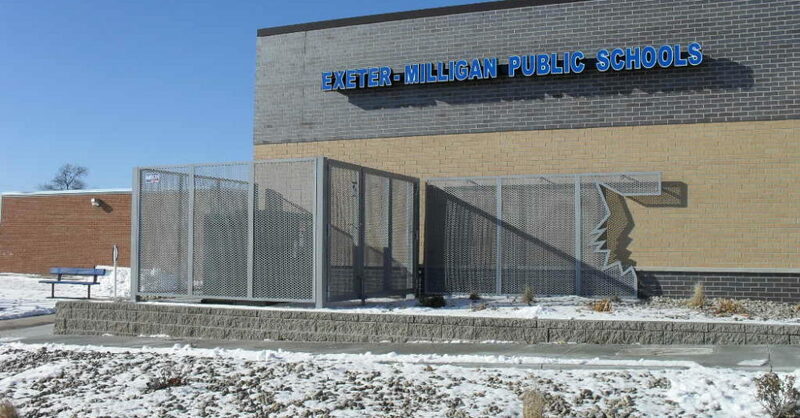 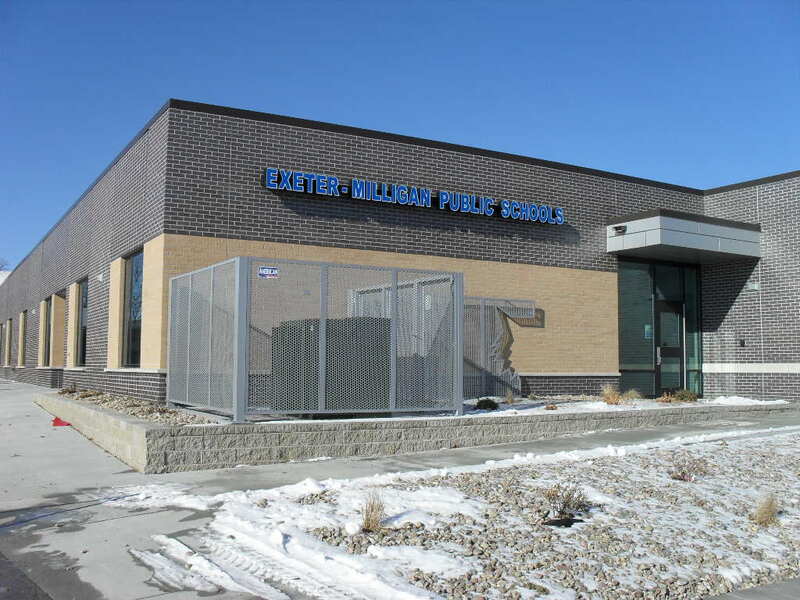 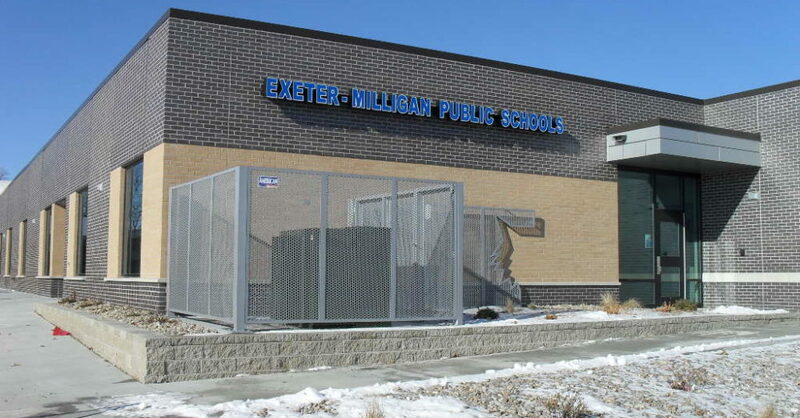 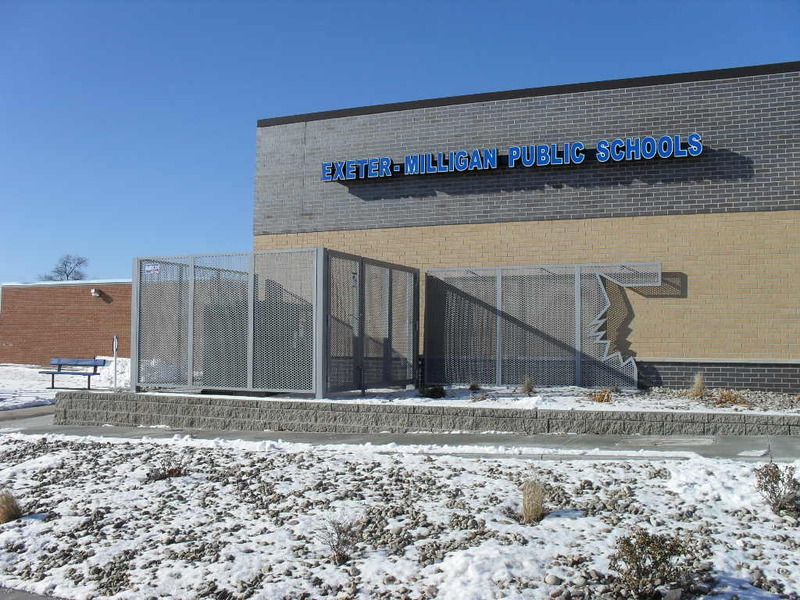 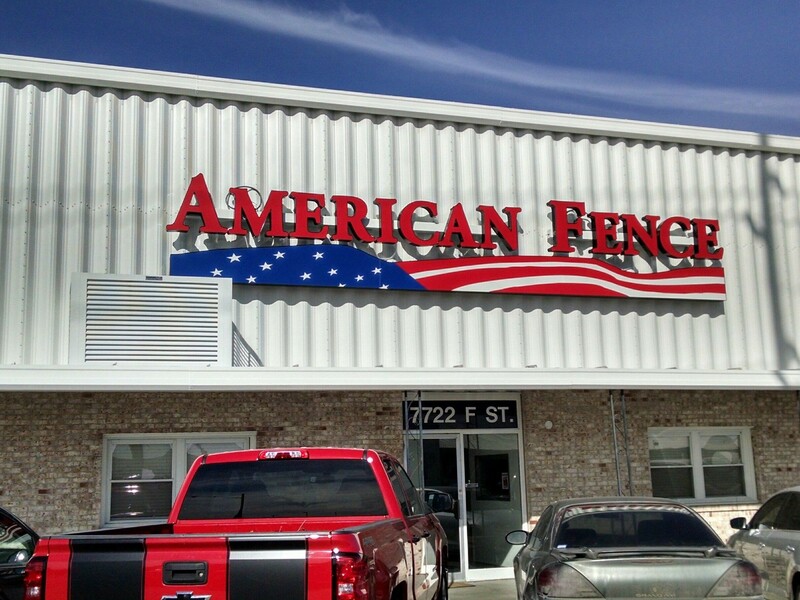 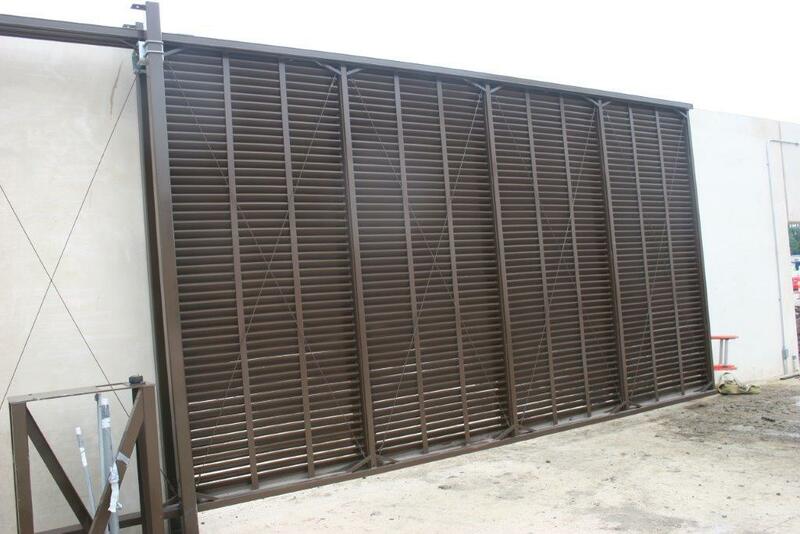 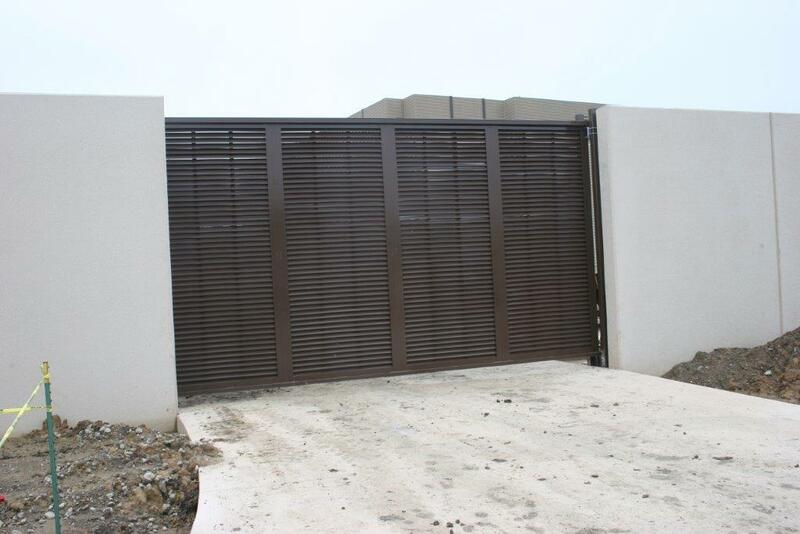 Architectural mechanical louvered fence system. 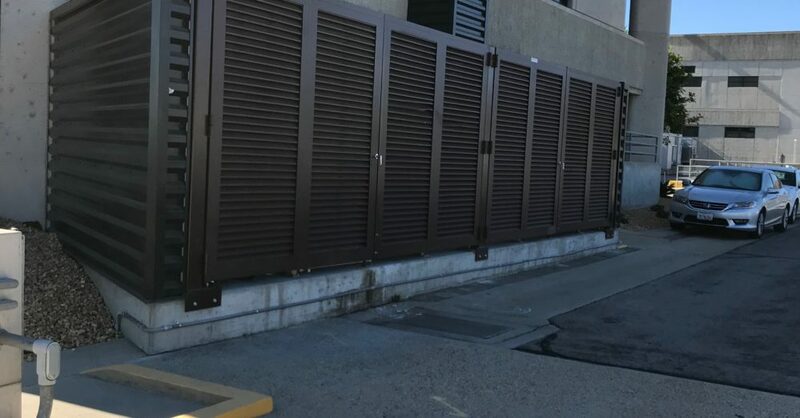 Compressors, air handlers, chillers, generators, transformers, emergency equipment, pumps and meters all should be secured and concealed from public access. 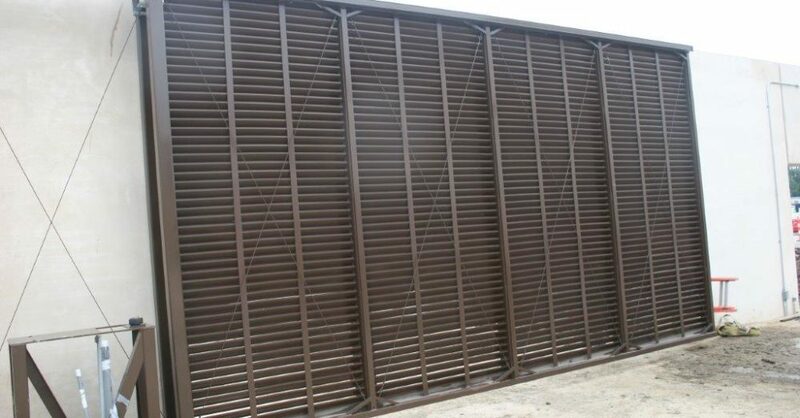 PalmSHIELD is your solution. 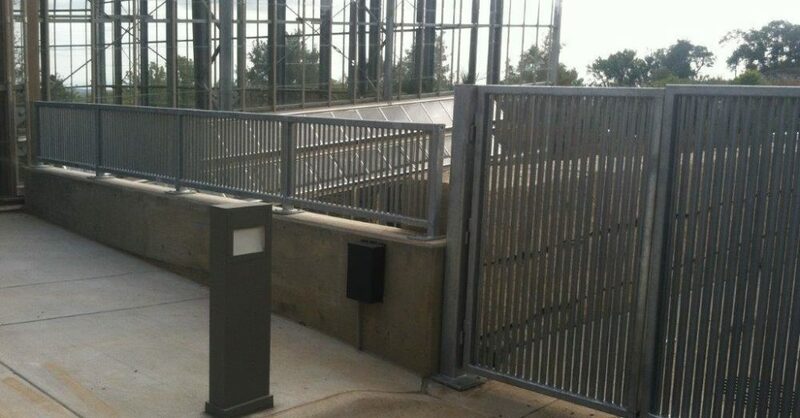 PalmSHIELD SDSU. 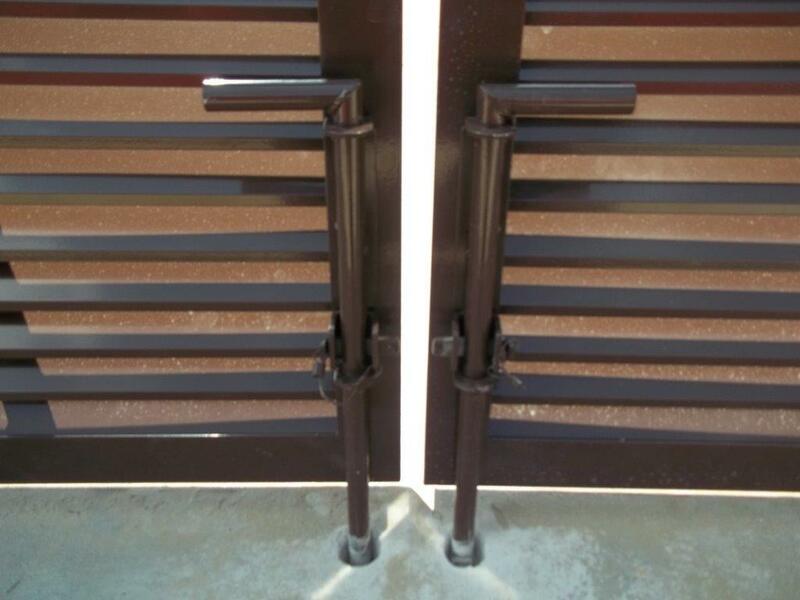 Hinges and latch are neat and clean. 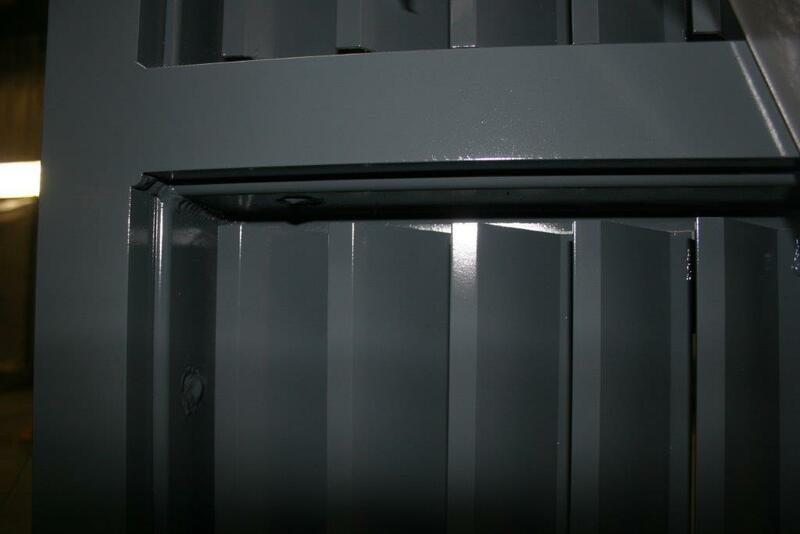 Perfect for mechanical equipment enclosures. 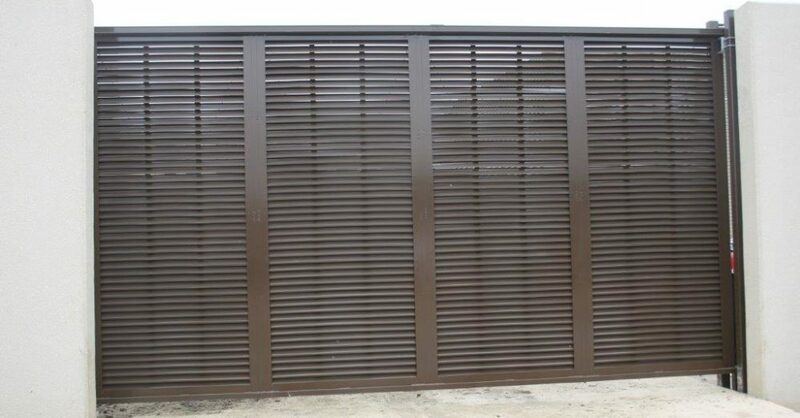 A great louvered equipment enclosure. 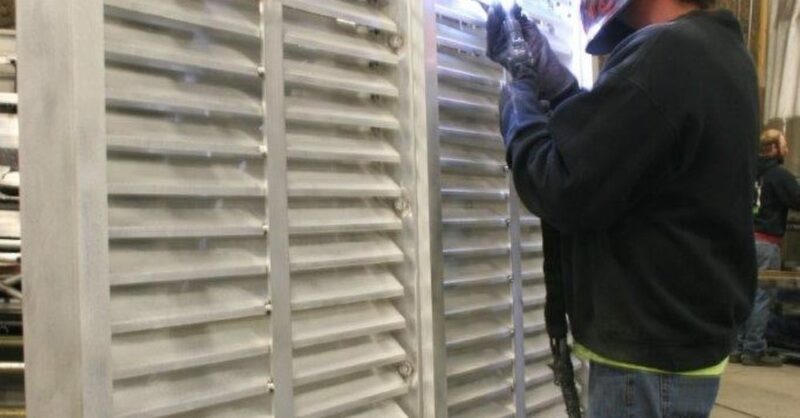 Architects, engineers, facility managers and property owners are all specifying PalmSHIELD. 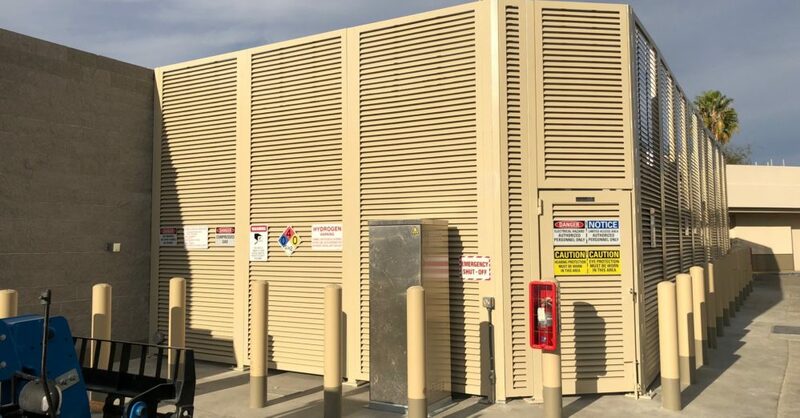 Compressors, air handlers, chillers, generators, transformers, emergency equipment, pumps and meters all should be secured and concealed from public access. 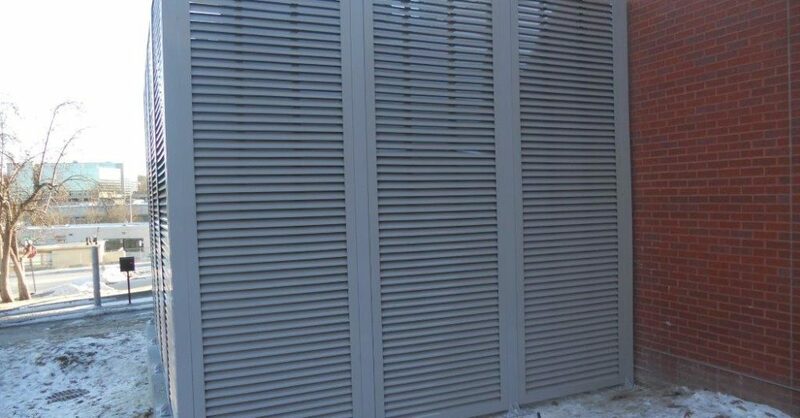 PalmSHIELD is your solution. 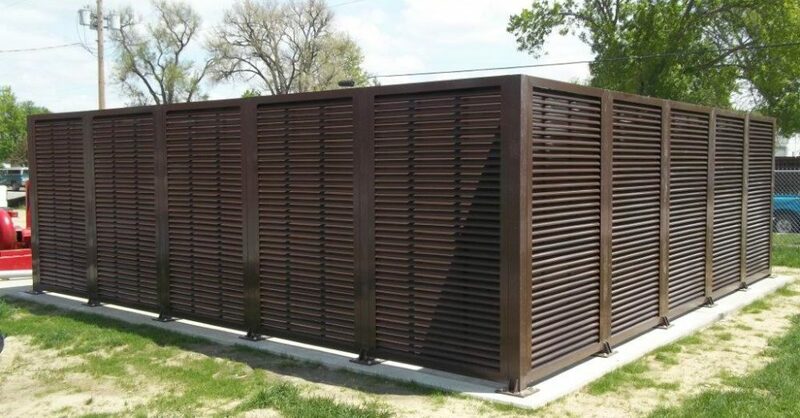 A great louvered equipment enclosure. 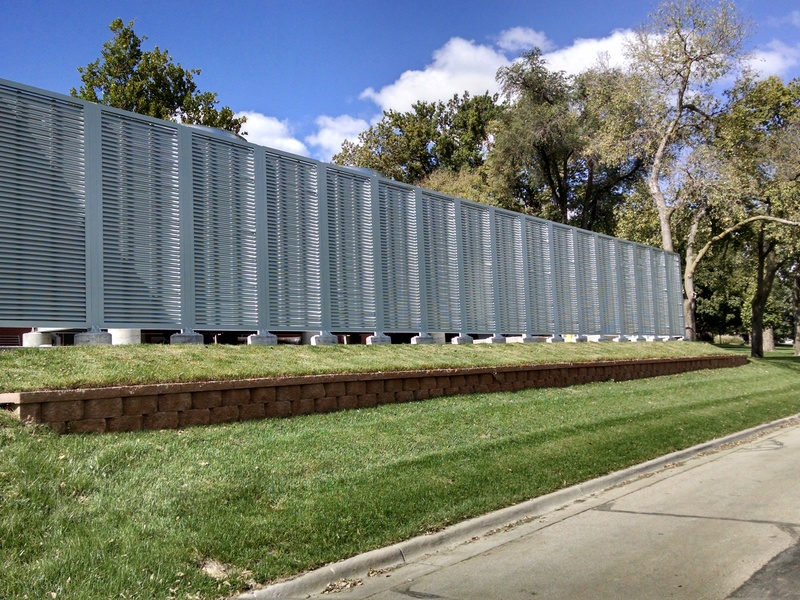 PalmSHIELD mechanical equipment enclosure at SDSU. 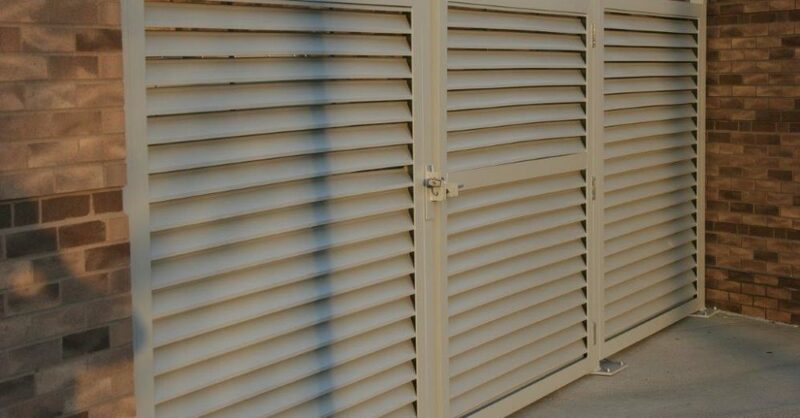 PalmSHIELD is engineered to run the distance. 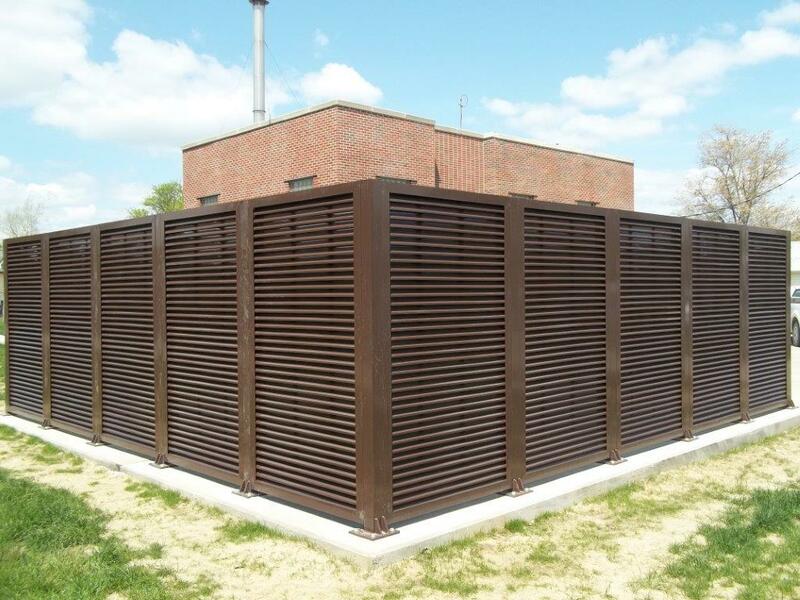 A great louvered equipment enclosure. 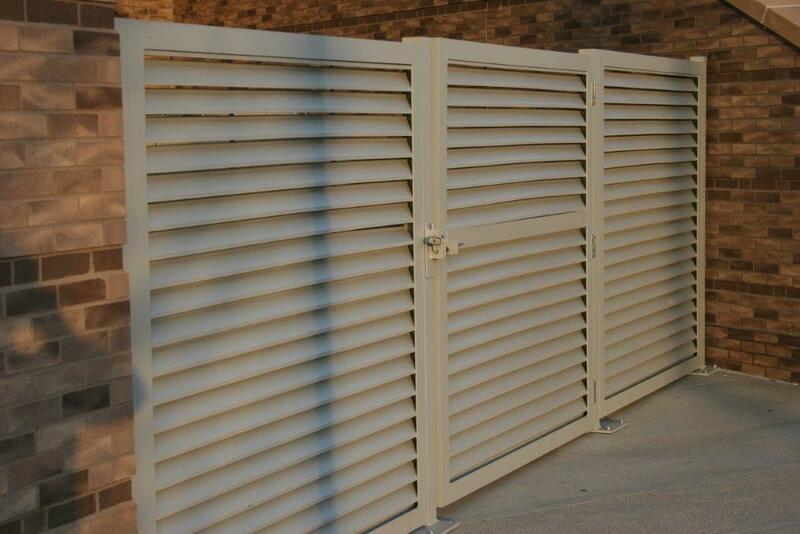 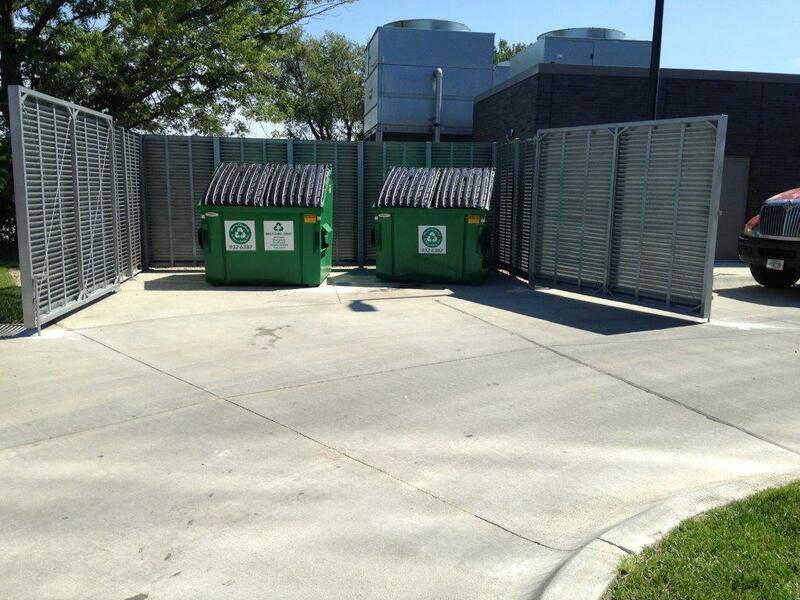 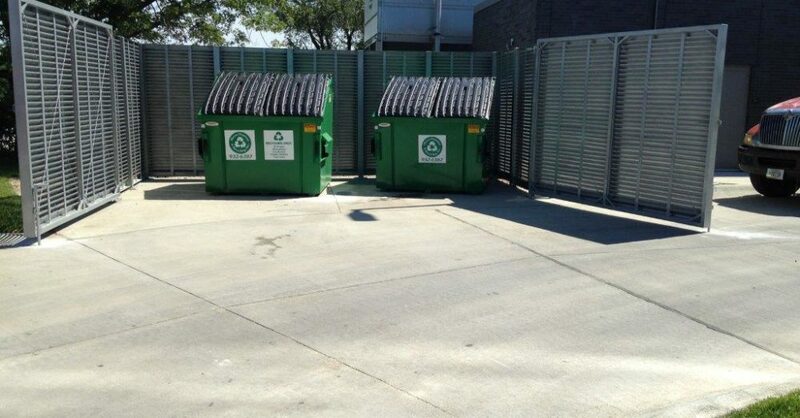 PalmSHIELD is the perfect solution to hide unsightly trash dumpsters. 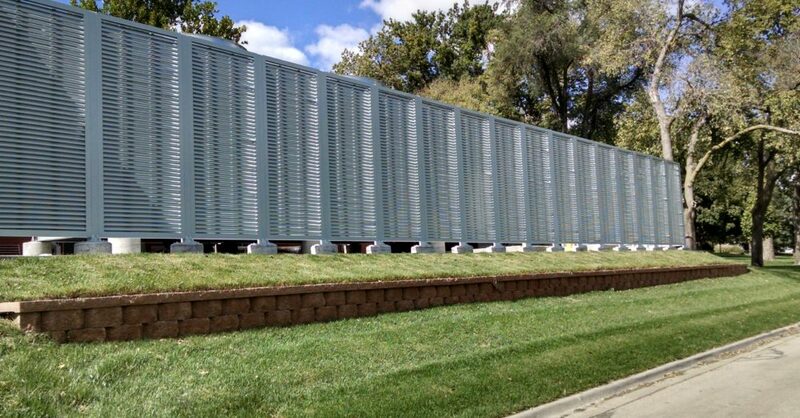 PalmSHIELD is the ultimate louvered screen wall. 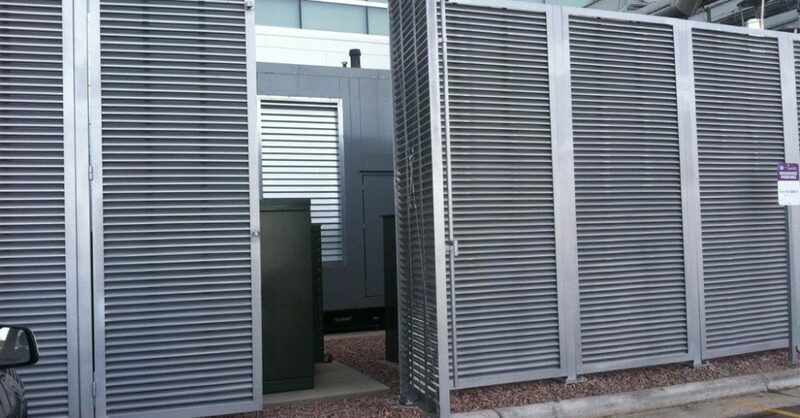 A great louvered equipment enclosure. 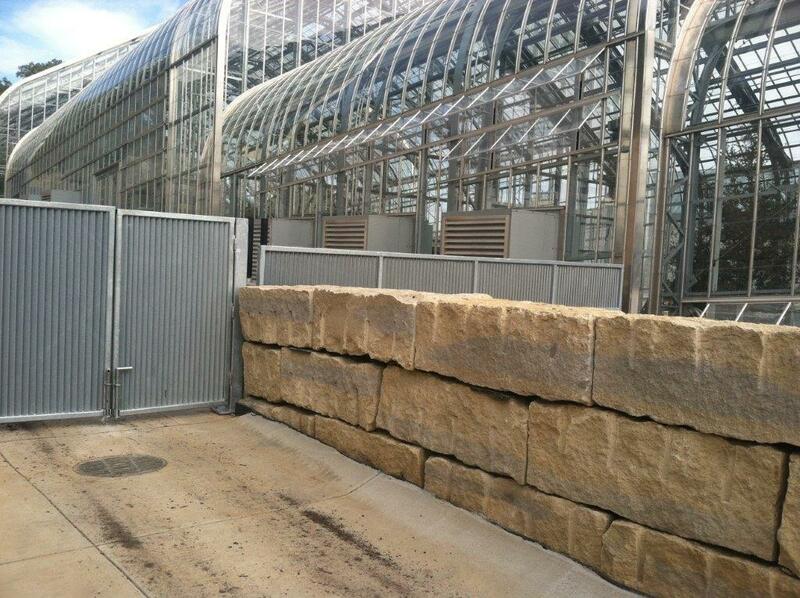 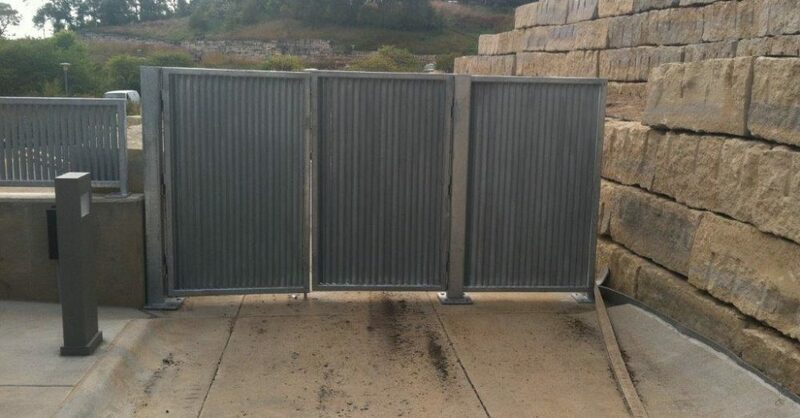 Do you need a vehicle barrier that provides both security and limited visibility. 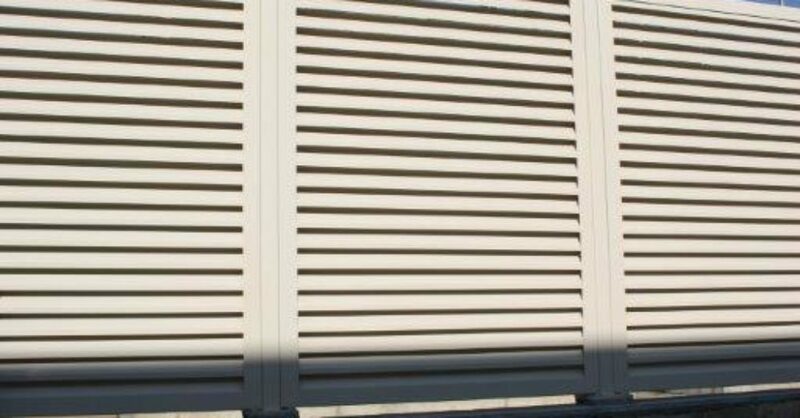 PalmSHIELD is your solution. 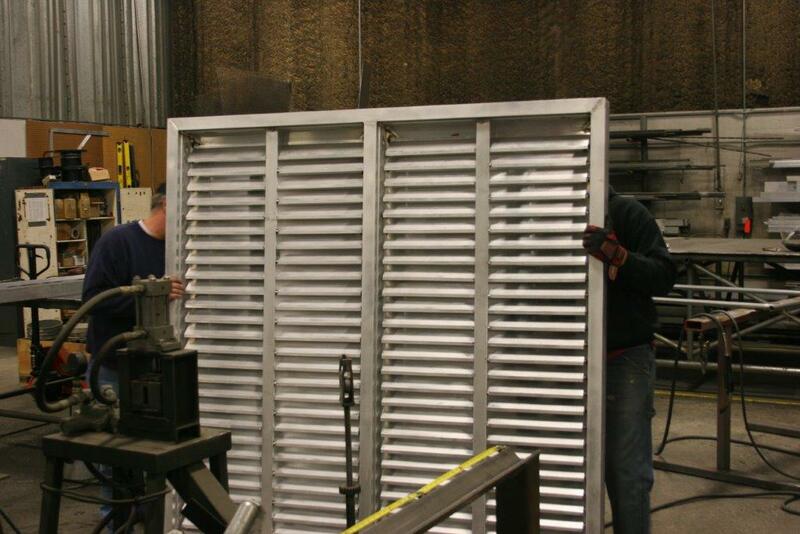 Architects, engineers, facility and property managers are selecting PalmSHIELD. 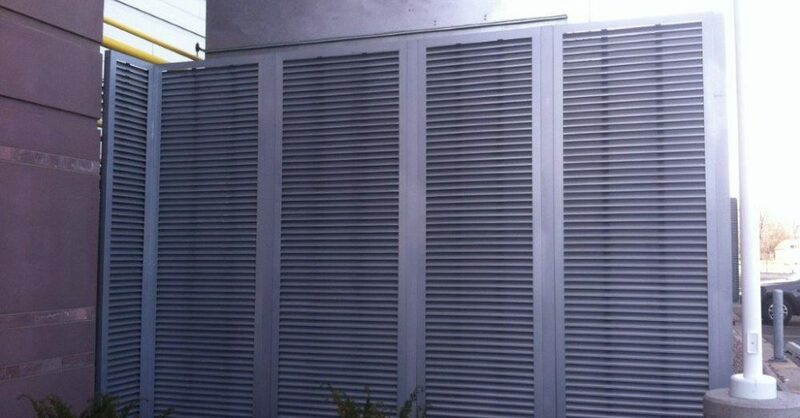 Medical and Health Providers are selecting PalmSHIELD. 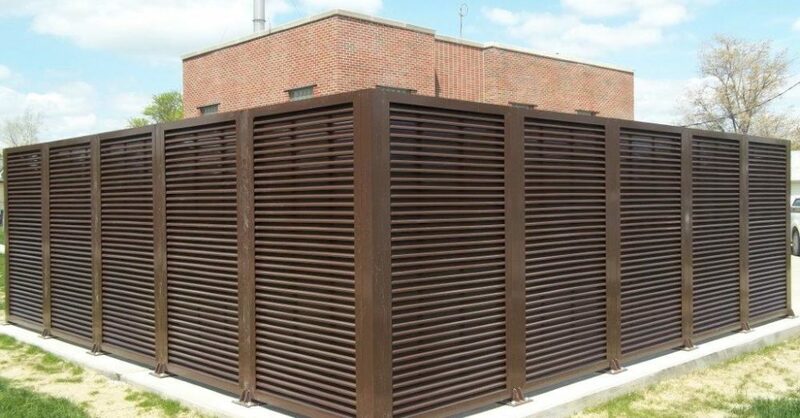 A great louvered equipment enclosure. 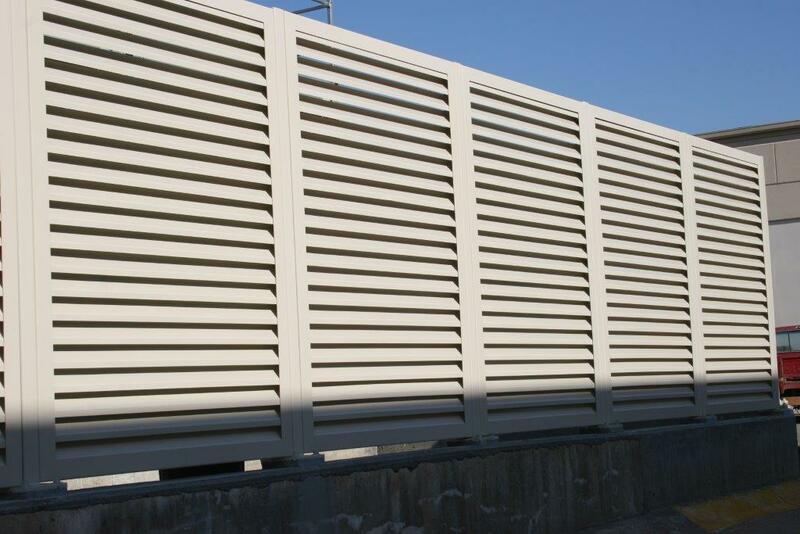 Hospitals, public health facilities and health providers chose PalmSHIELD for its seamless appearance. 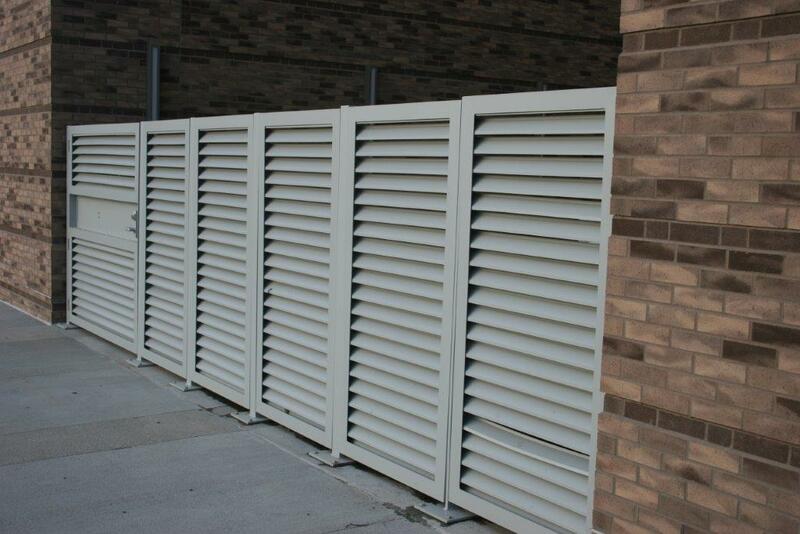 A great louvered equipment enclosure. 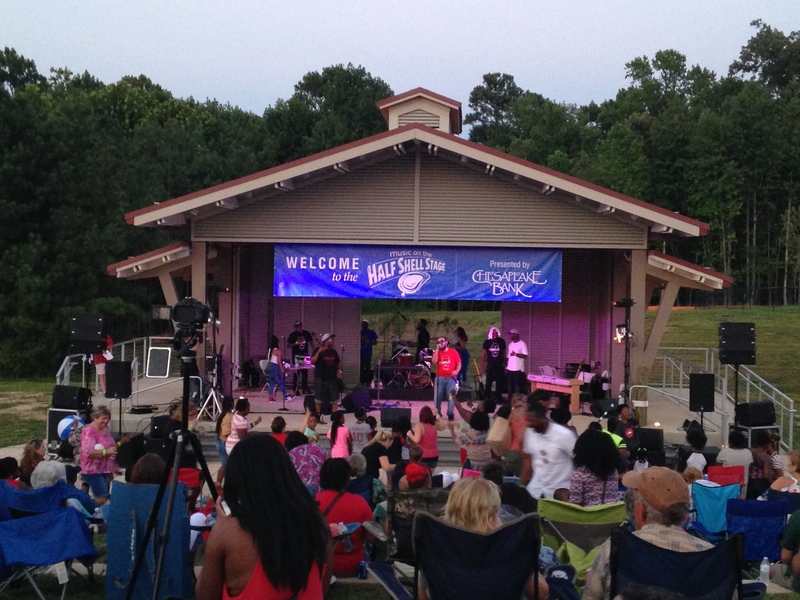 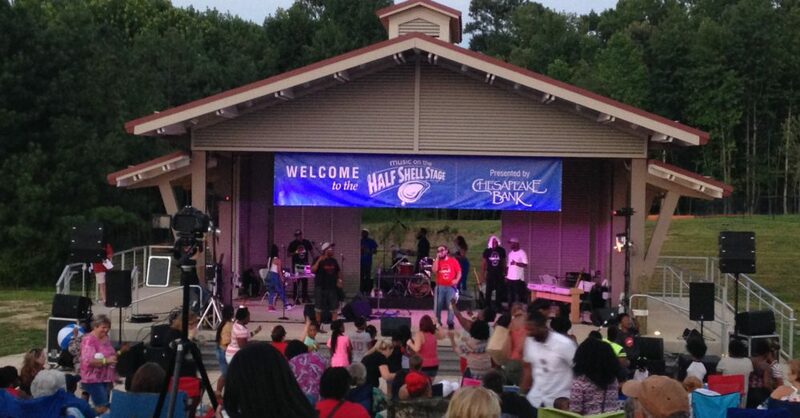 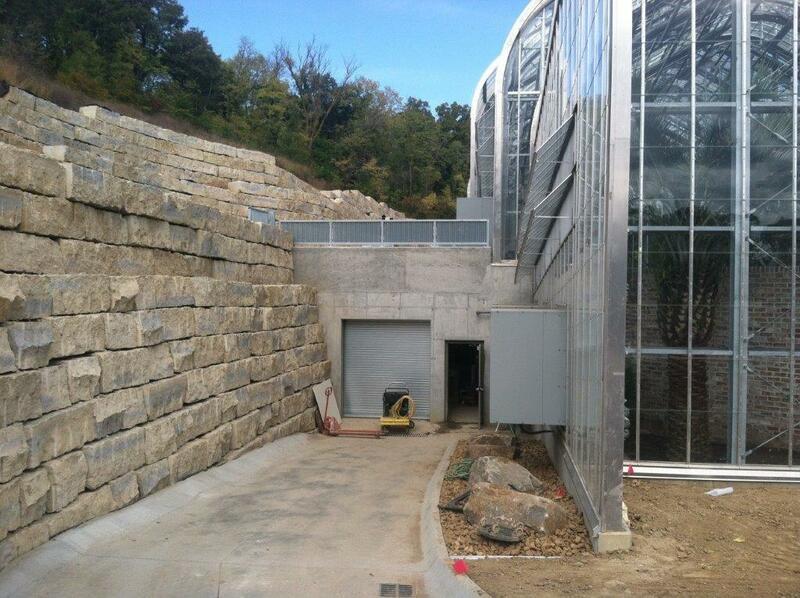 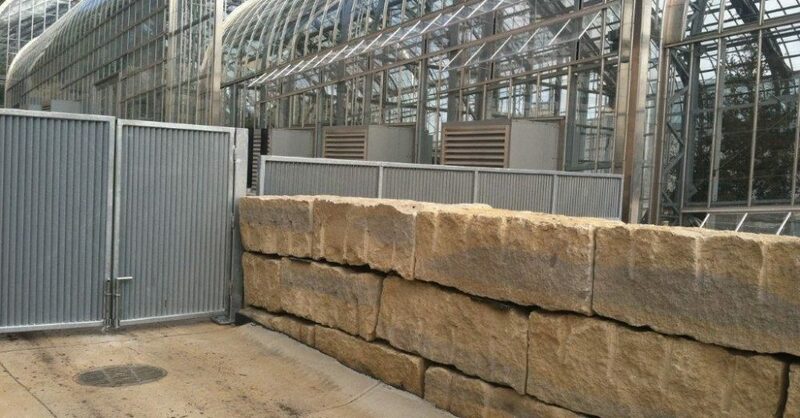 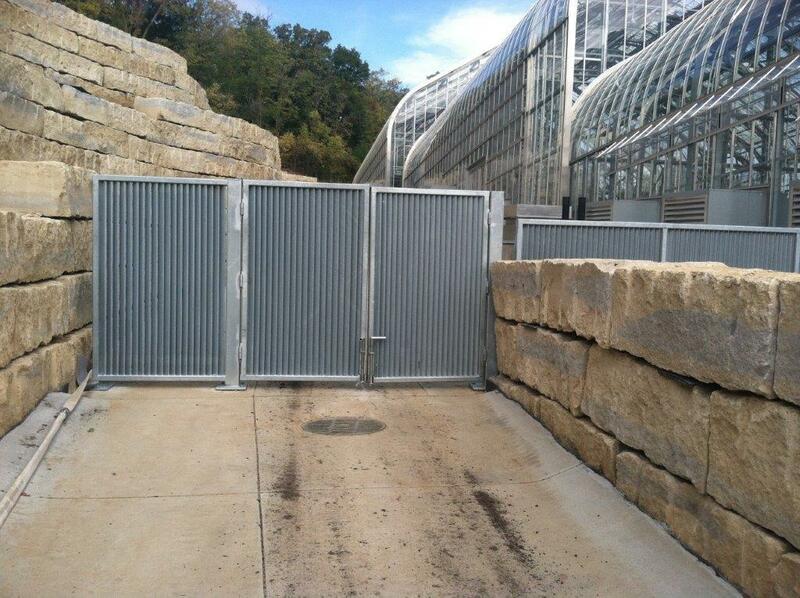 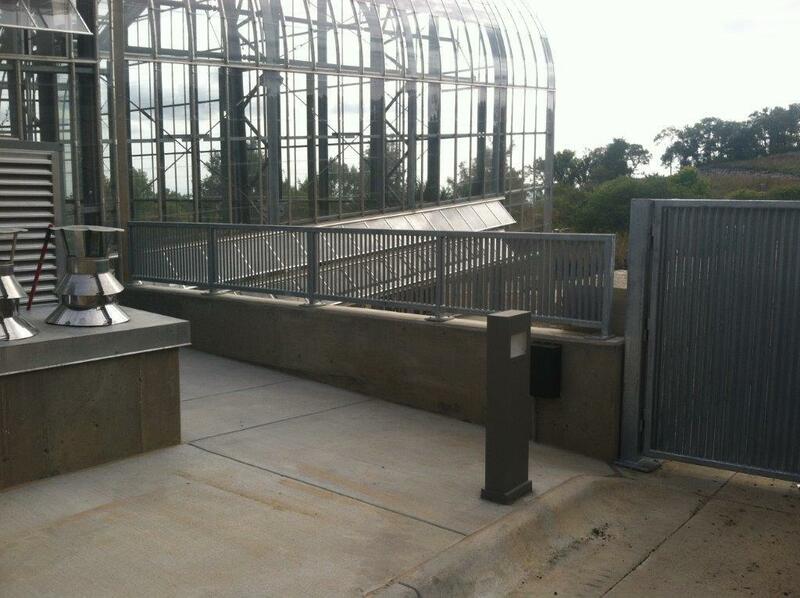 Amusement parks, zoos, and public parks are selecting PalmSHIELD as a total security and concealment solution. 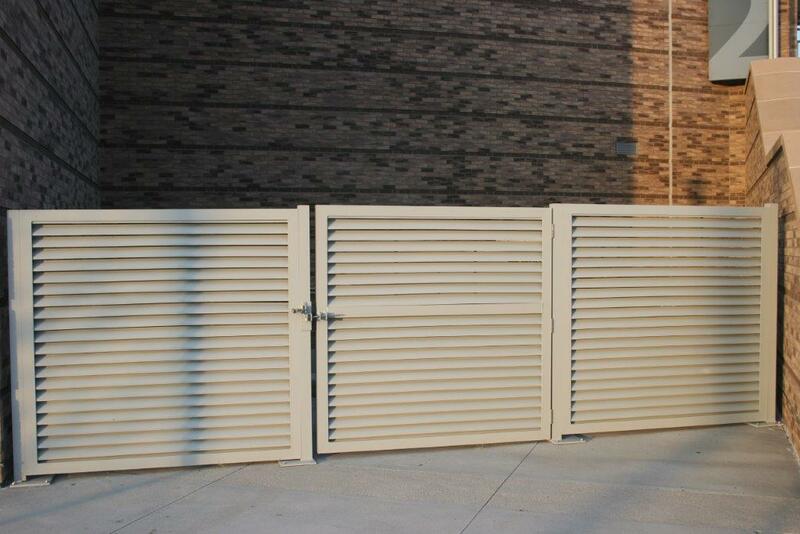 PalmSHIELD is an excellent solution for temporary and permanent control of pedestrian traffic. 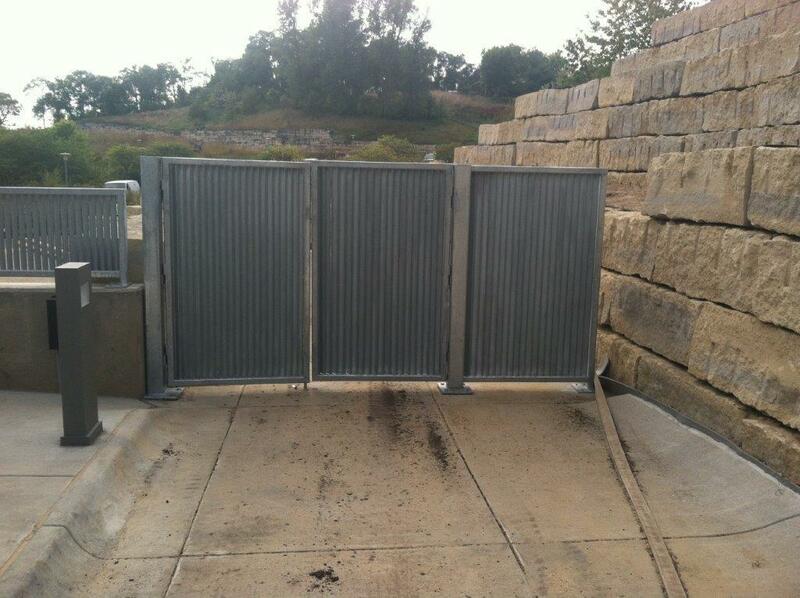 Gates can be provided for any type of access. 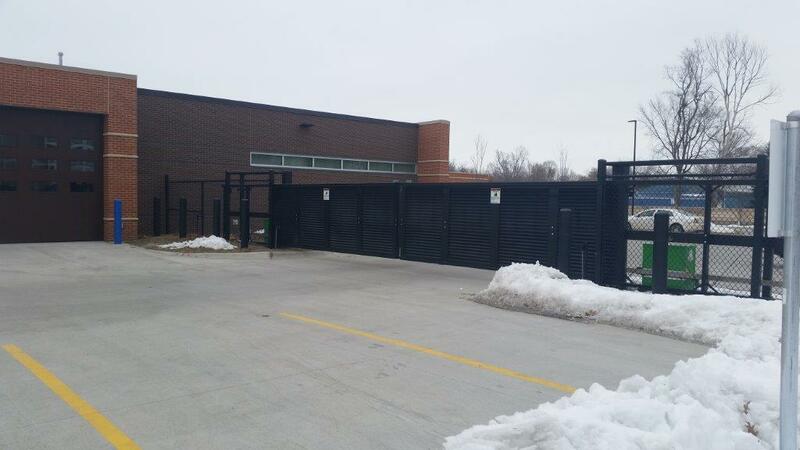 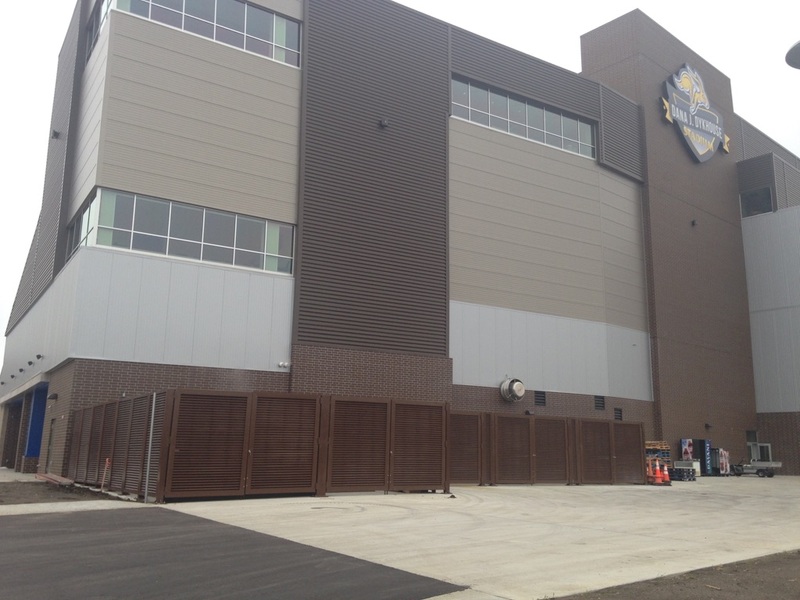 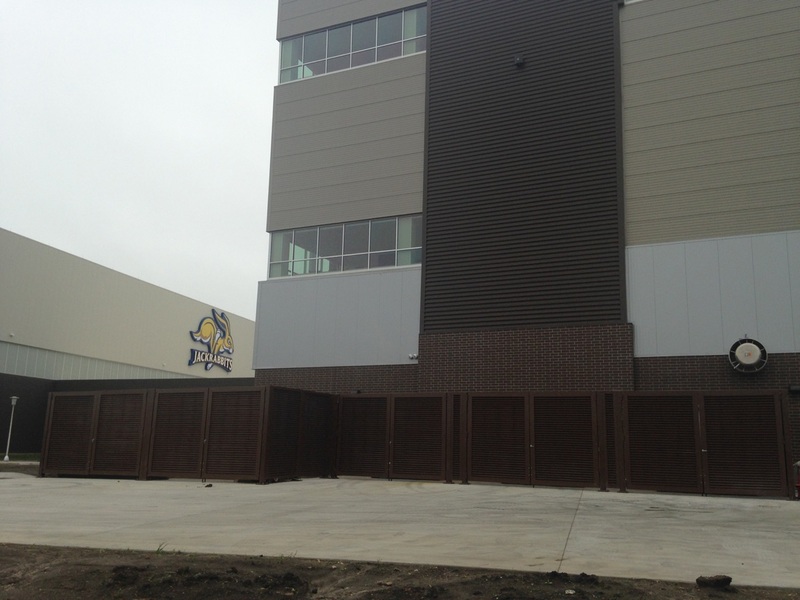 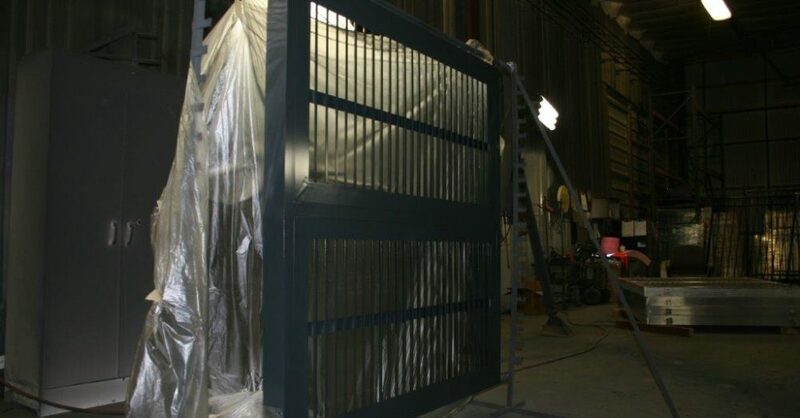 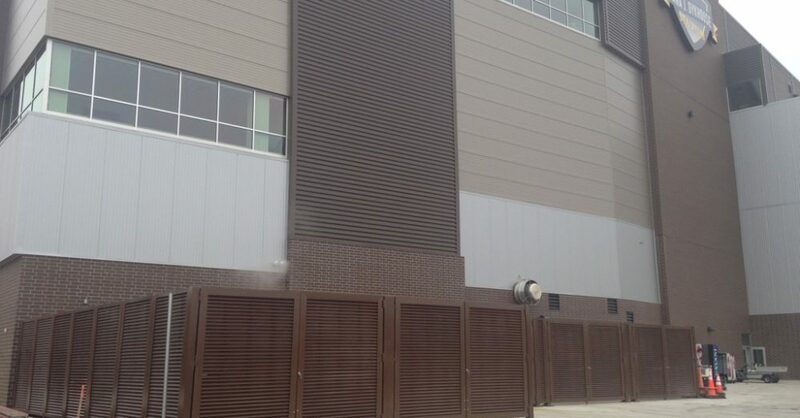 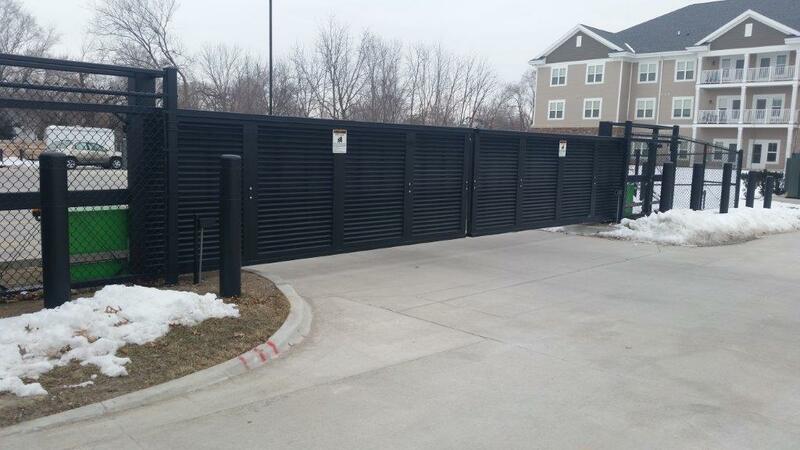 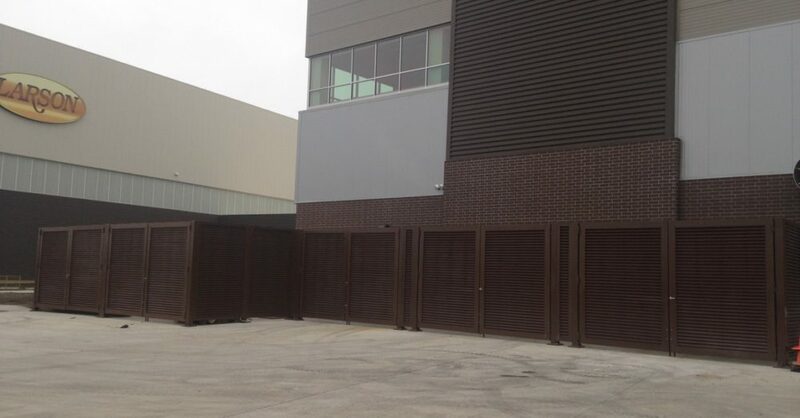 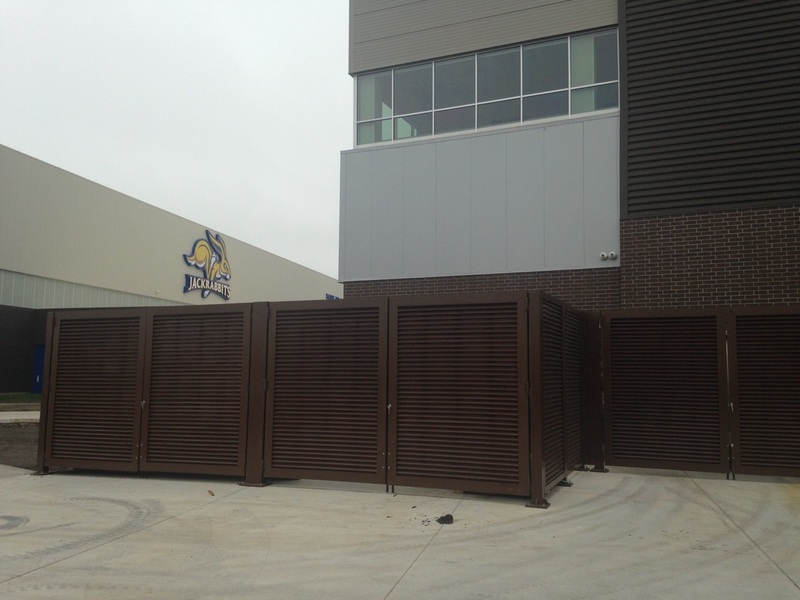 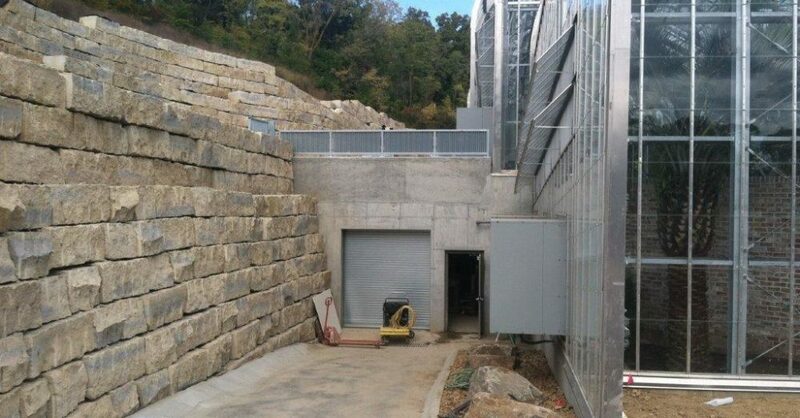 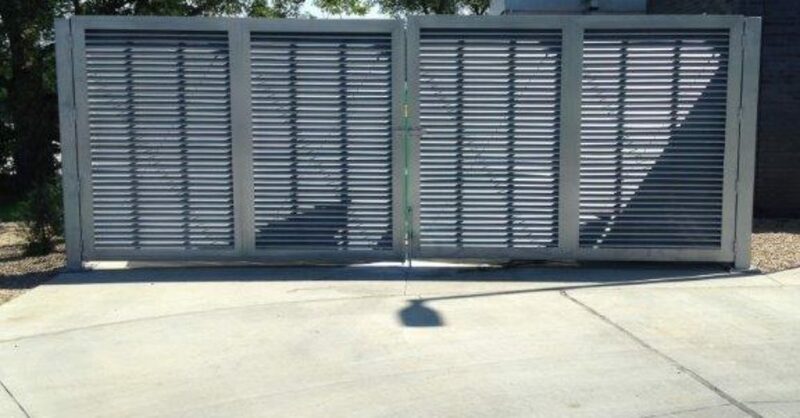 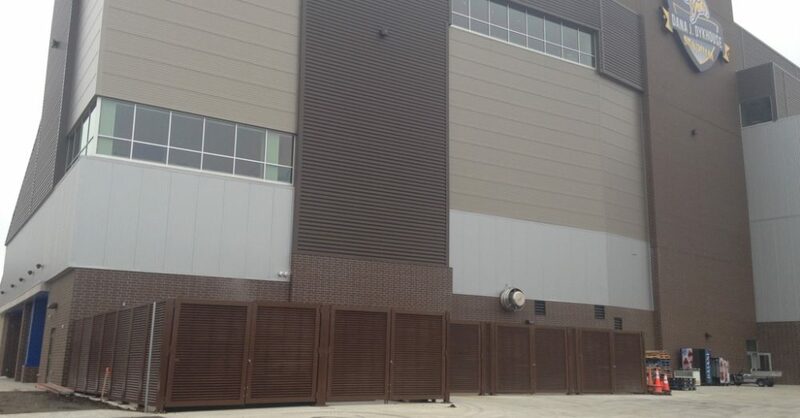 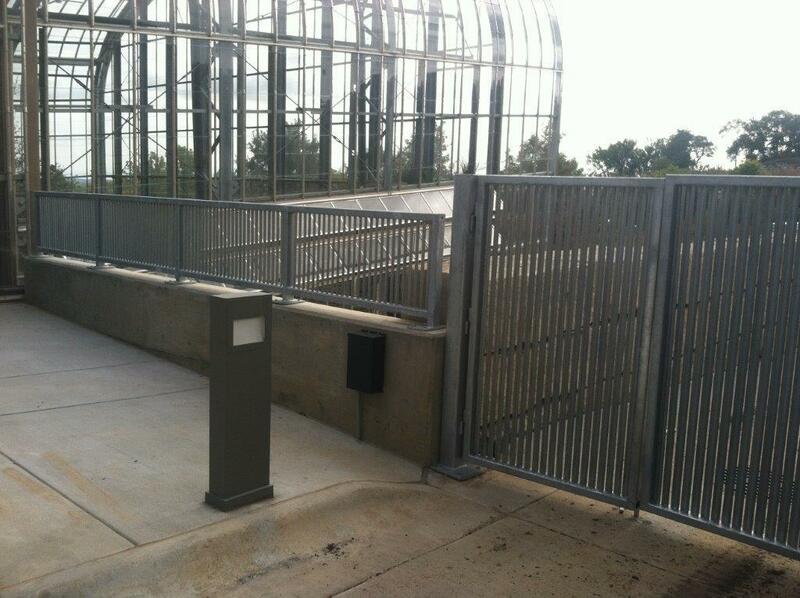 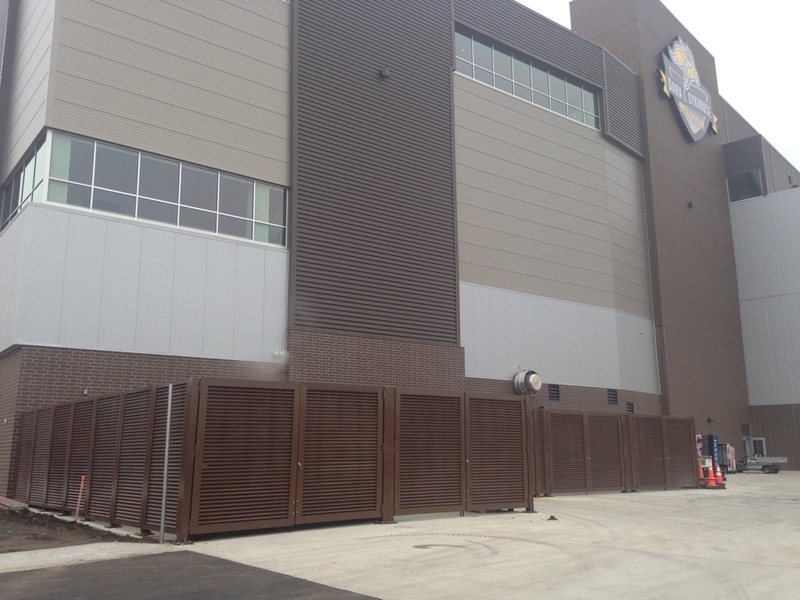 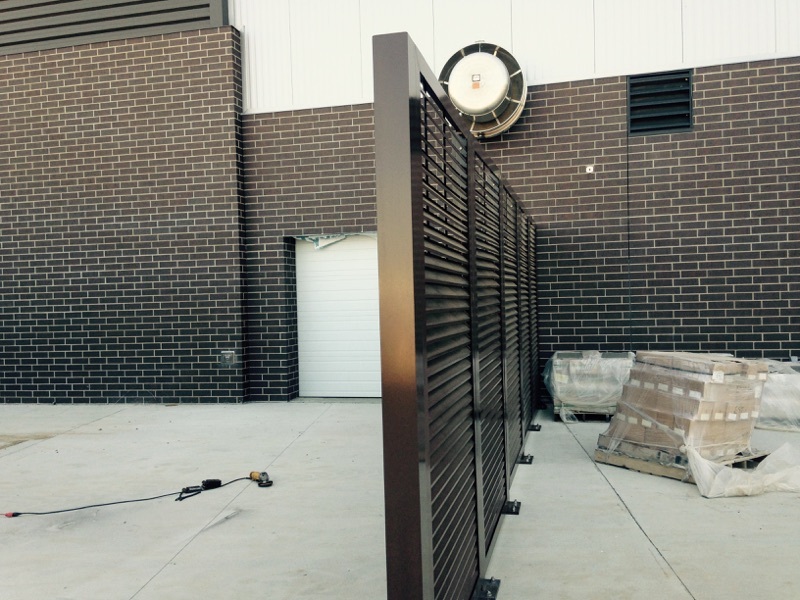 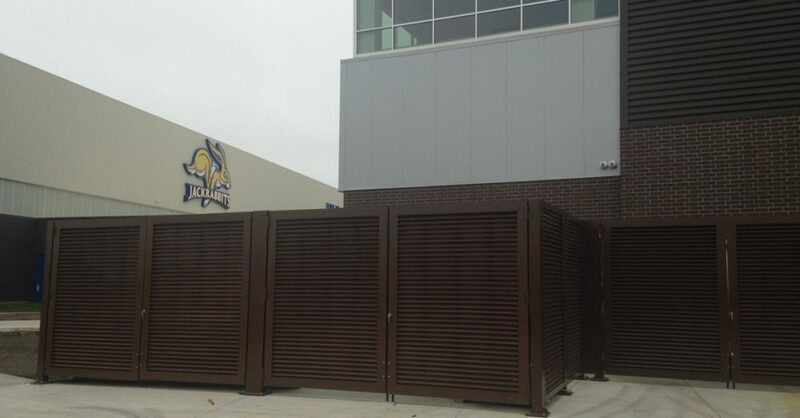 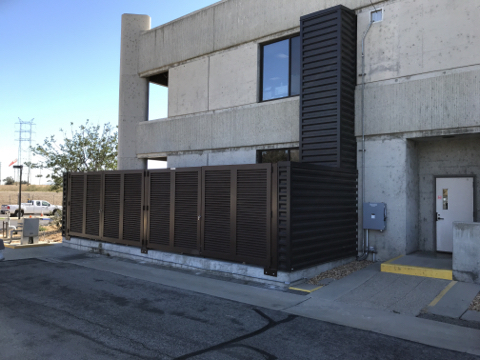 PalmSHIELD louvered cantilever gates protect entrance to data center. 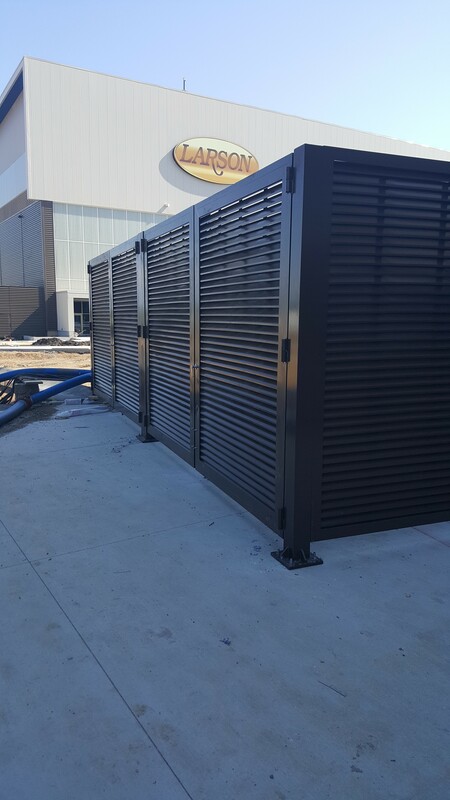 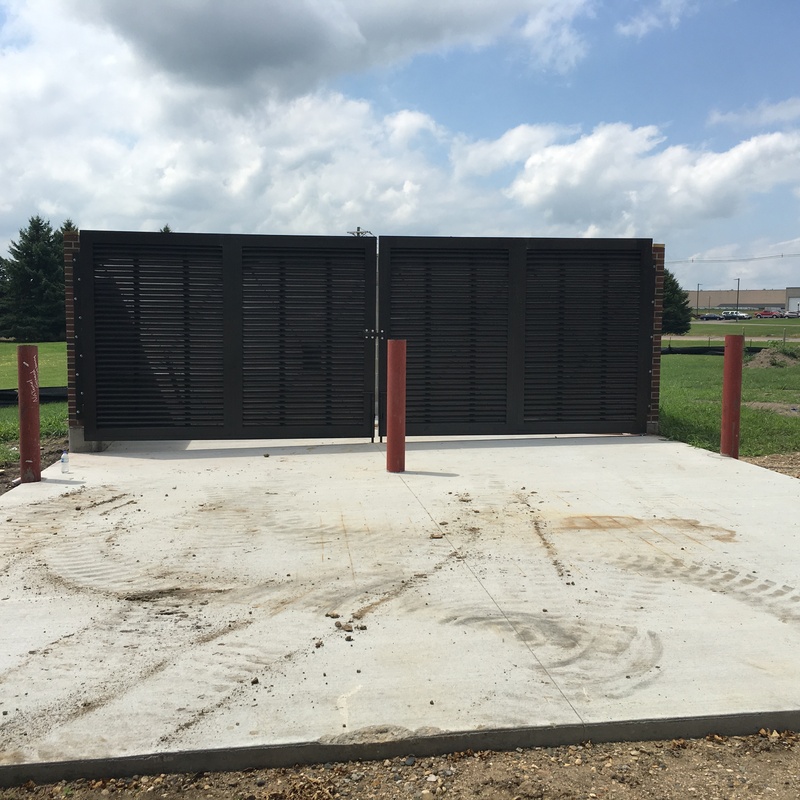 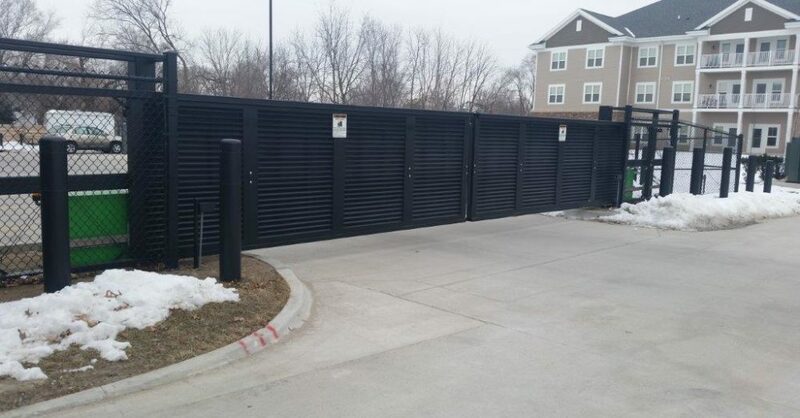 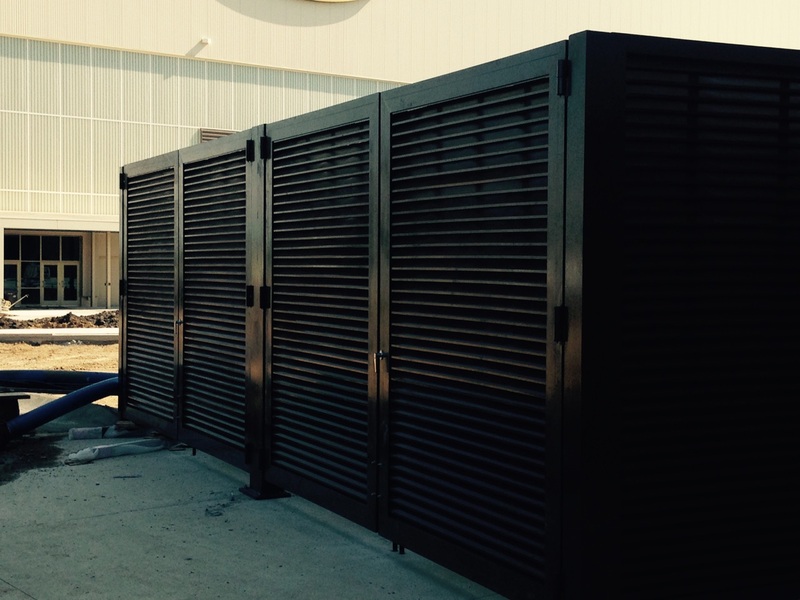 Ten foot tall cantilevered gates provide data center with a total security solution that restricts visibility and proven to be non-climable. 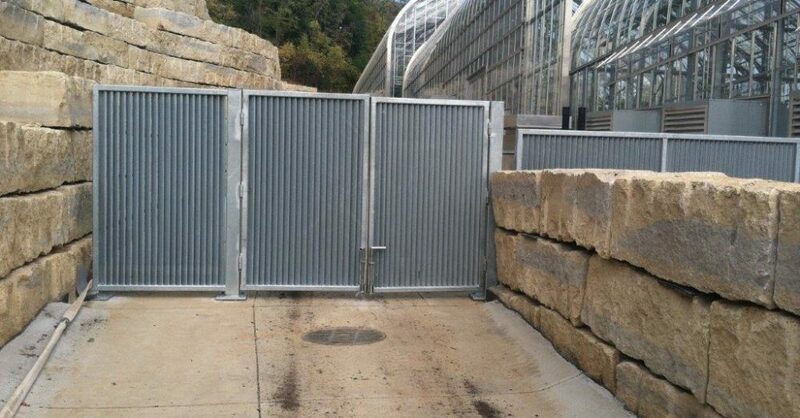 Limit traffic flow by providing a non-climable limited vision gates and screen. 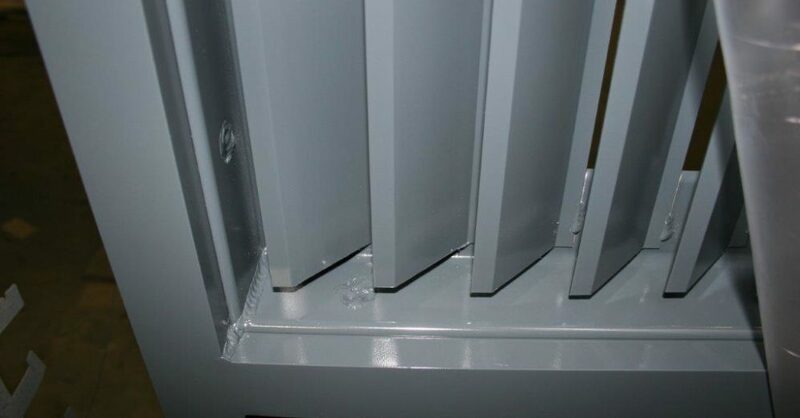 Students and children should be screened from mechanical and electrical equipment. 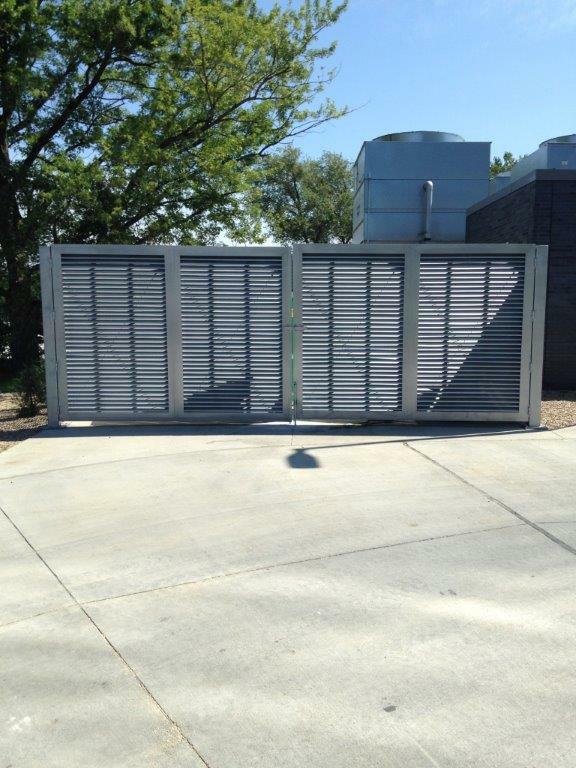 A great louvered equipment enclosure. 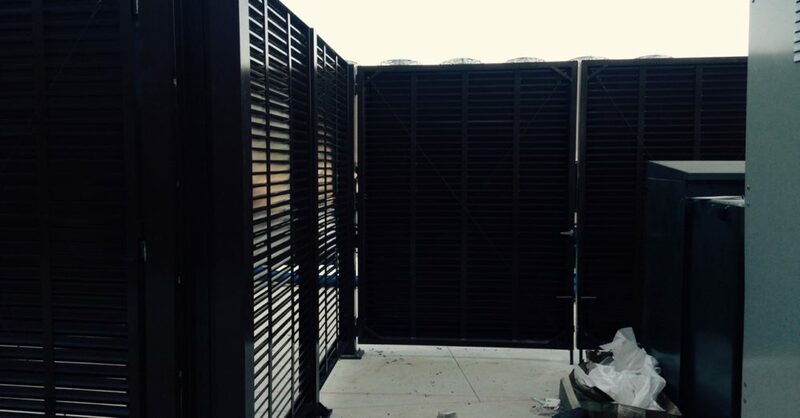 The only fully framed louvered screen system. 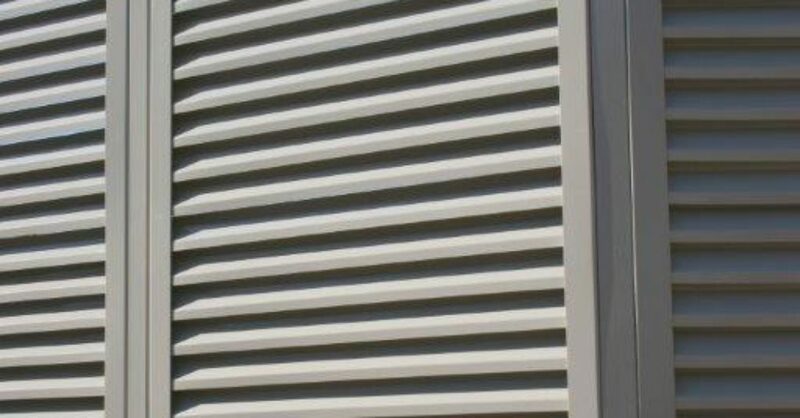 PalmSHIELD will provide unique angled connections. 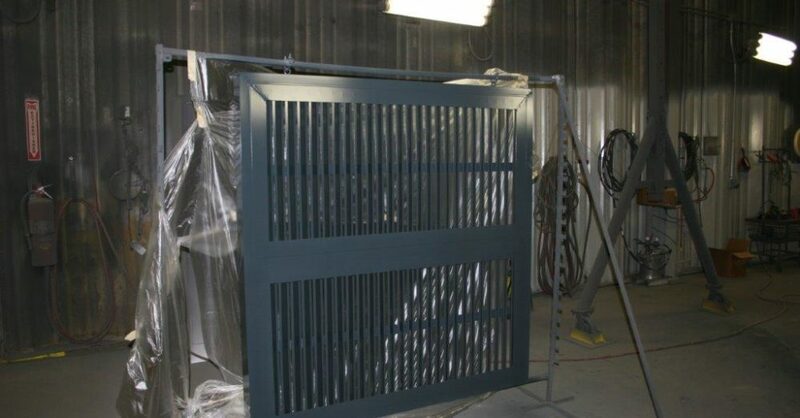 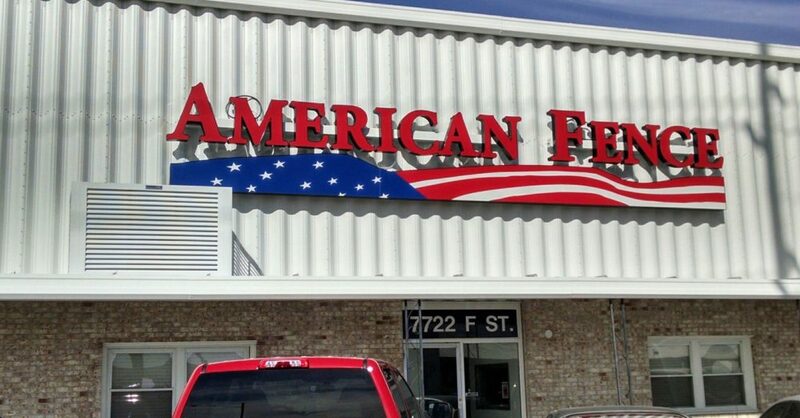 PalmSHIELD Louvers are available in custom colors. 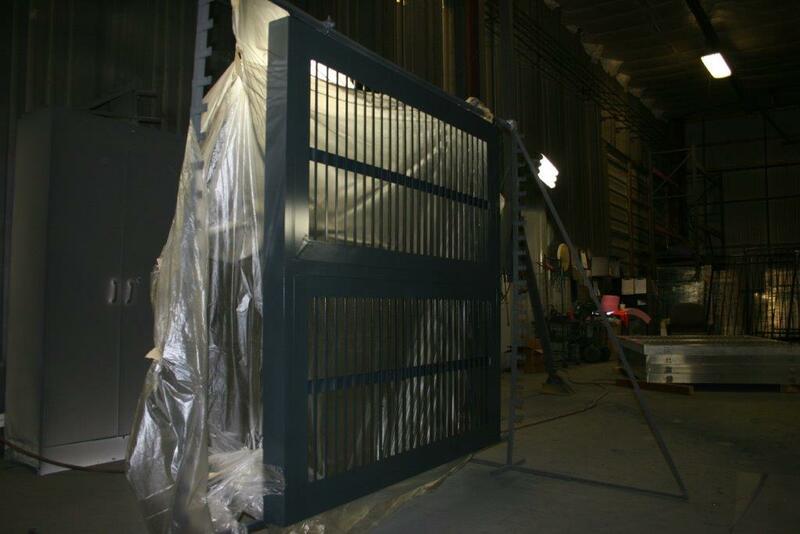 PalmSHIELD goes to great lengths to protect your finished installation. 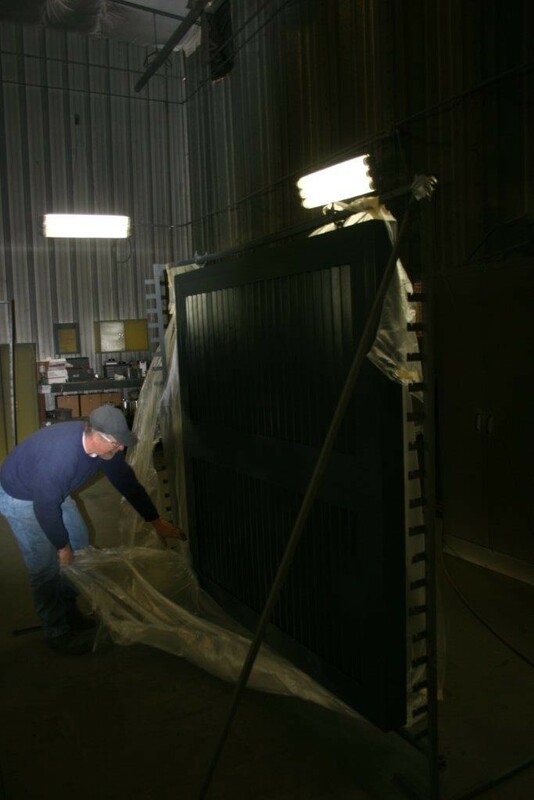 Each system is custom packaged and crated. 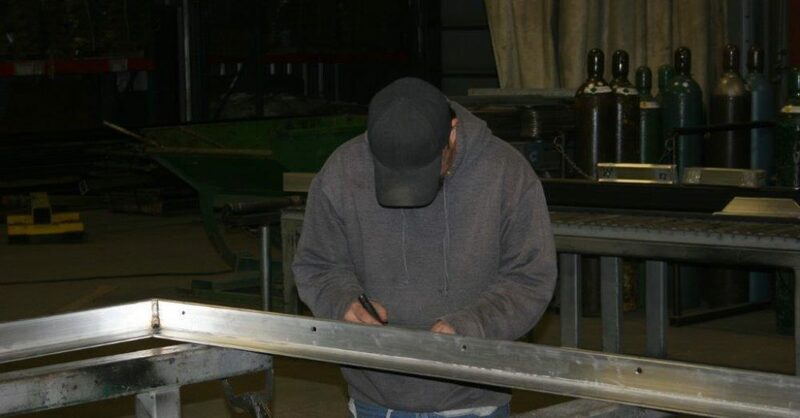 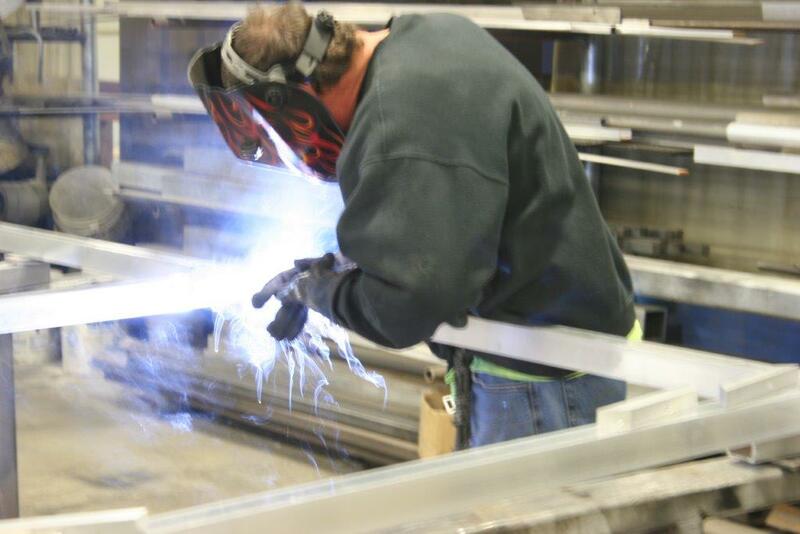 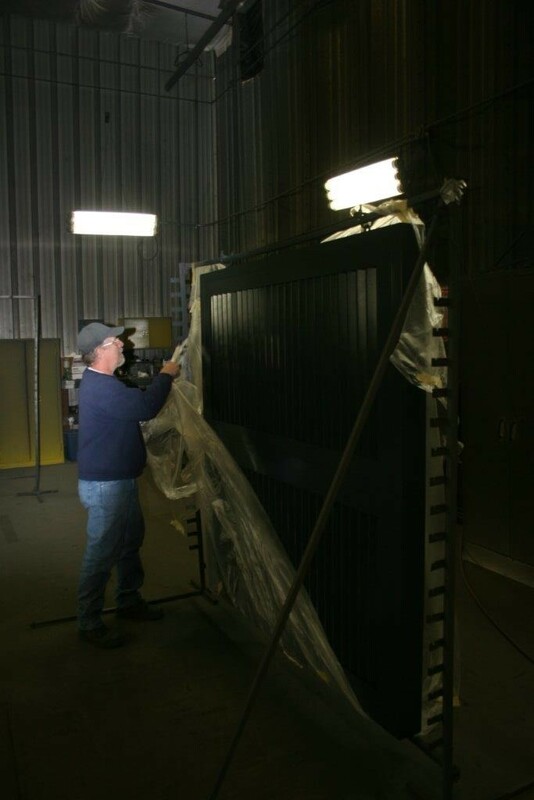 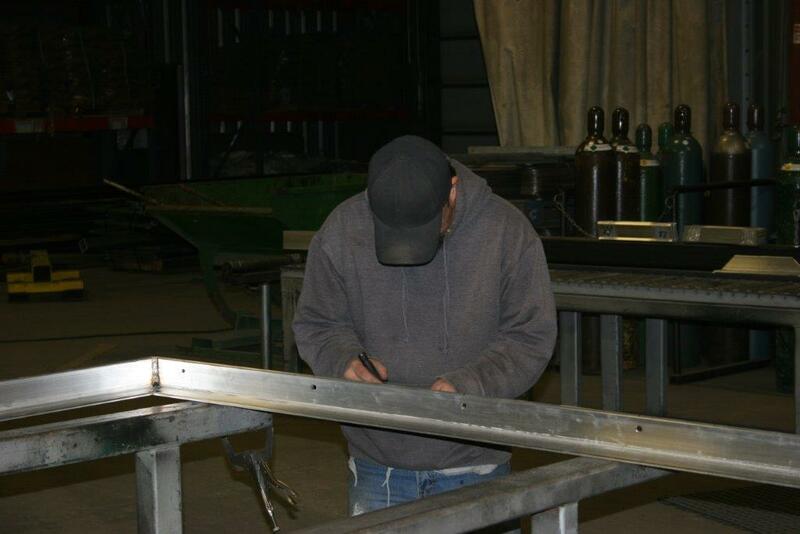 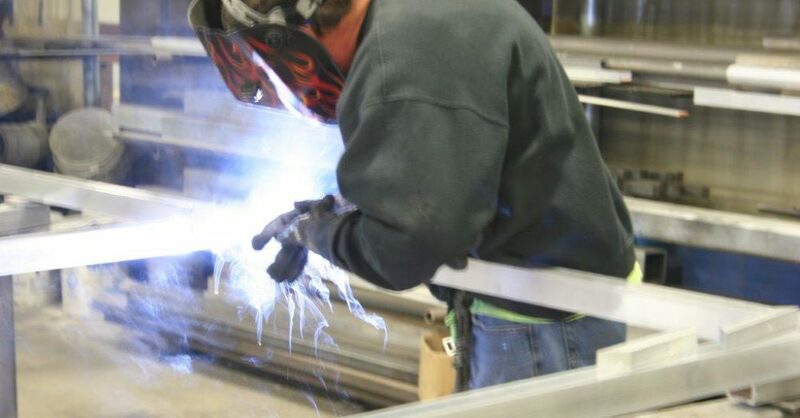 Each panel is inspected and packaged to protect your finished product during transportation. 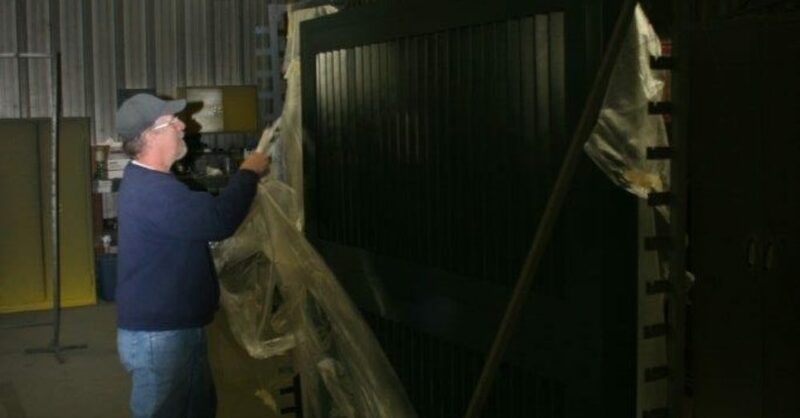 PalmSHIELD is the perfect solution for the National Guard in Minnesota. 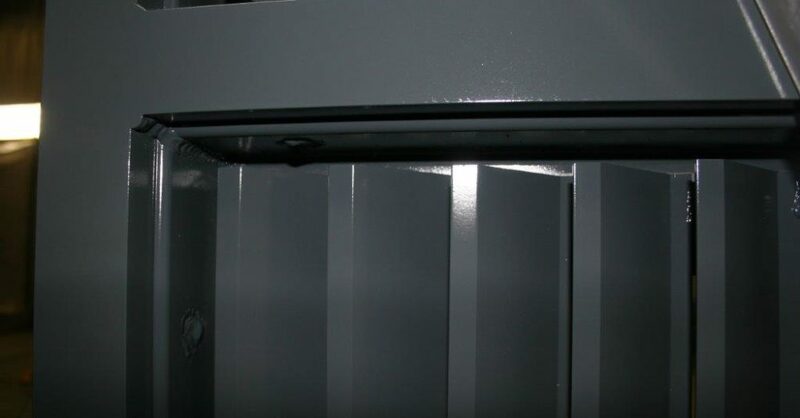 PalmSHIELD is used for a trash enclosure. 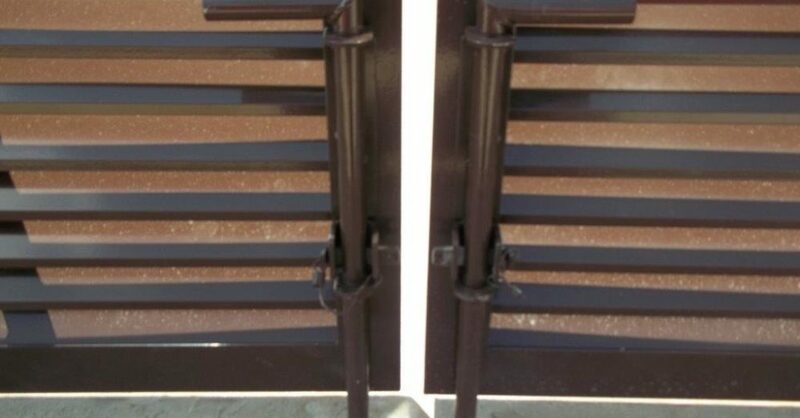 See PalmSHIELD from the backside. 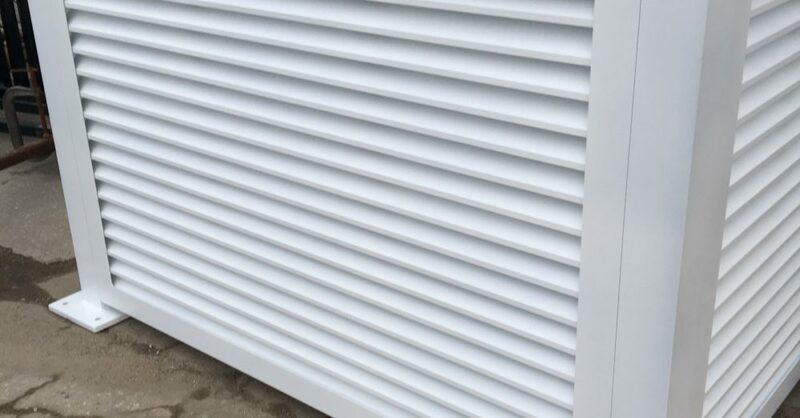 Clean and crisp. 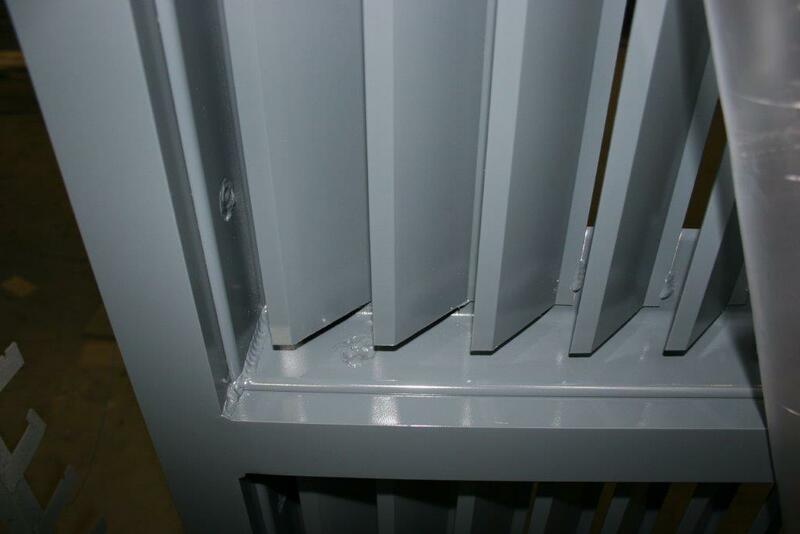 Perfect for mechanical screening and equipment enclosures. 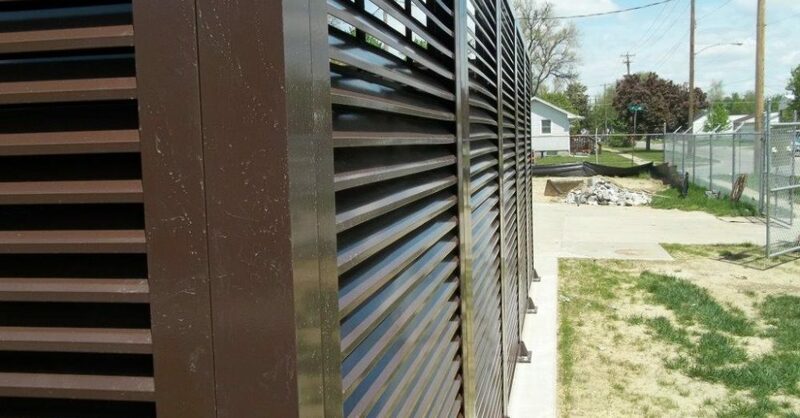 PalmSHIELD Fence line straight and true. 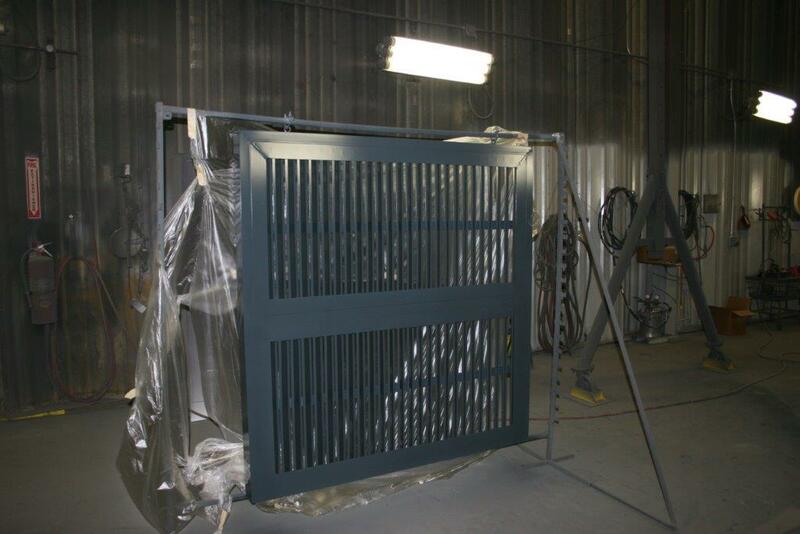 Perfect for mechanical equipment screening. 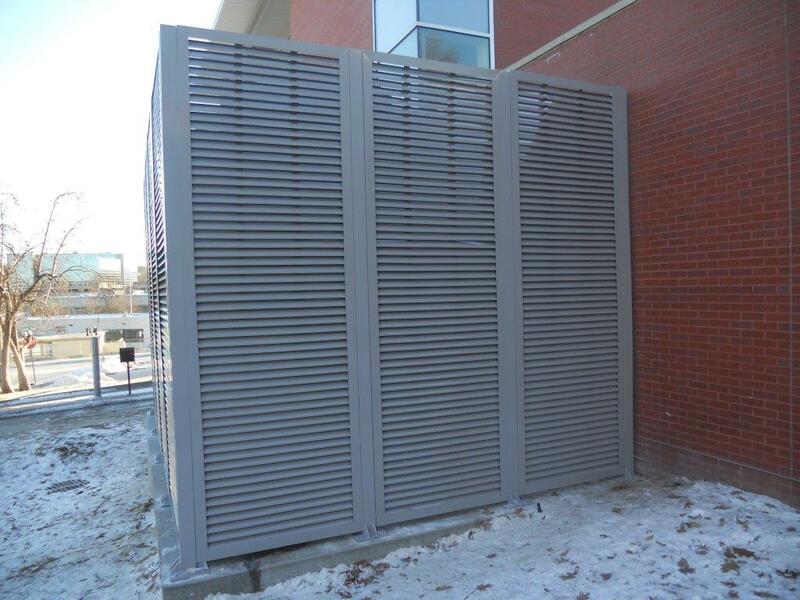 A great louvered equipment enclosure. 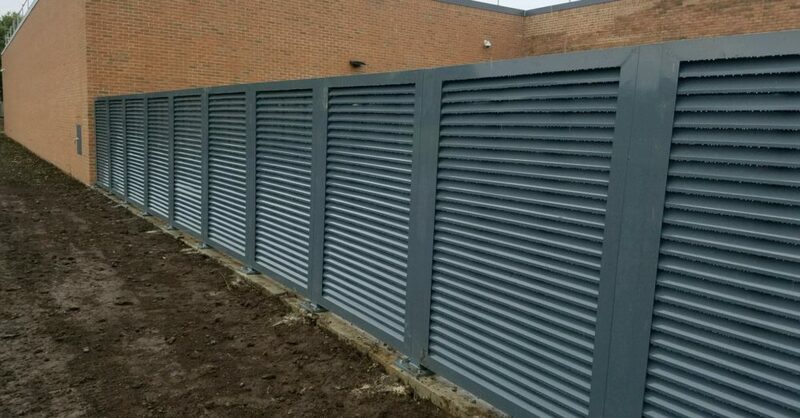 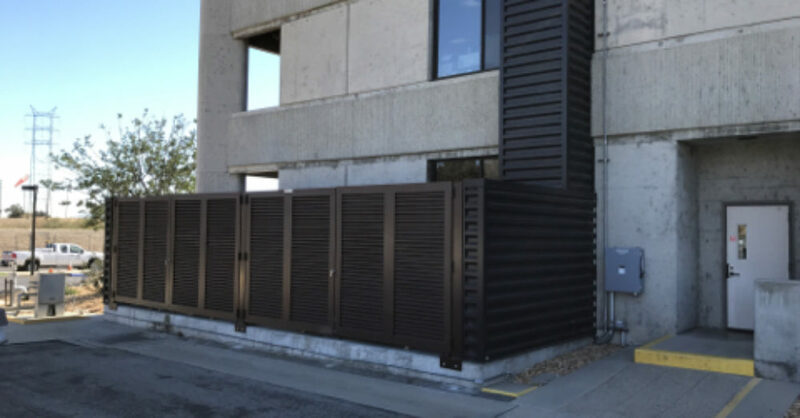 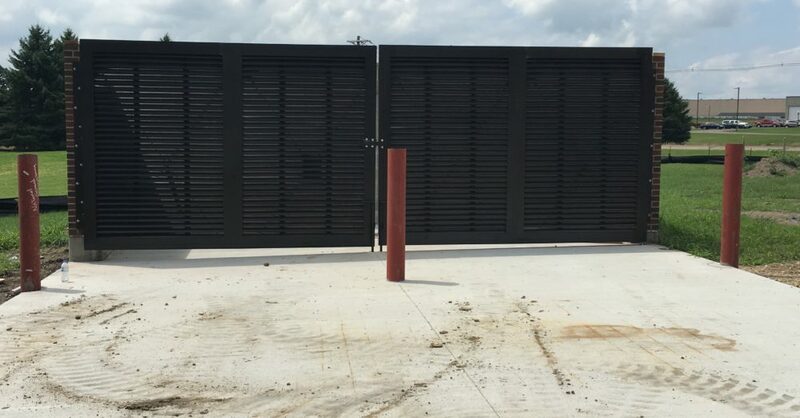 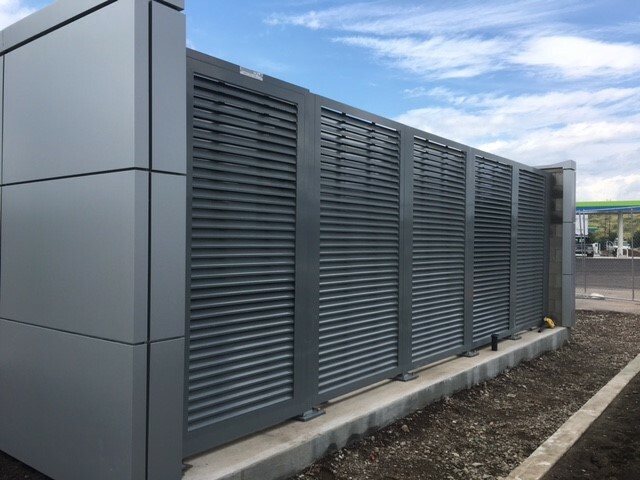 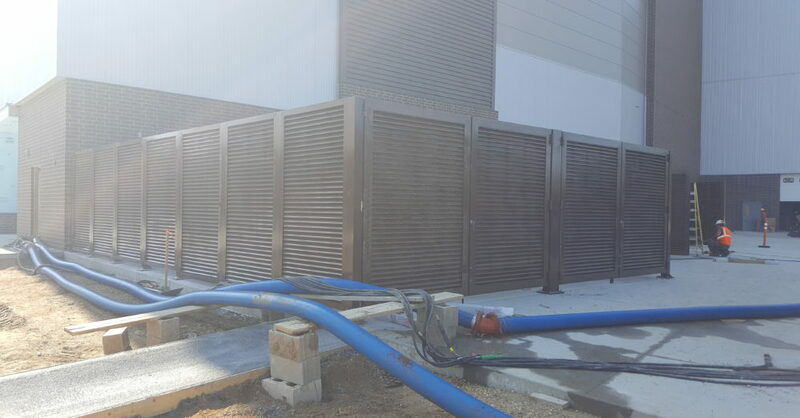 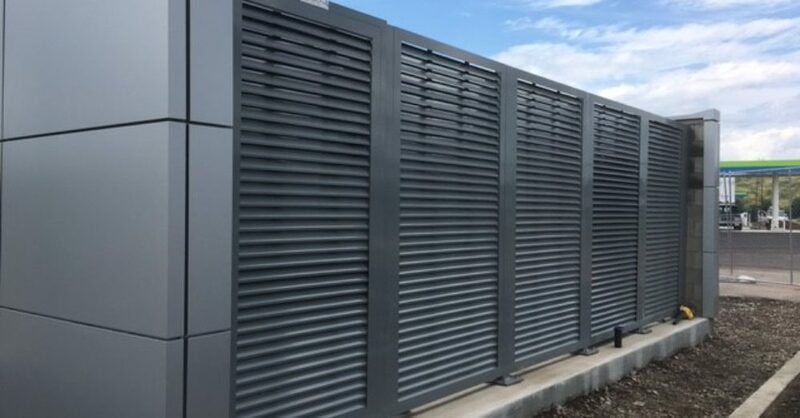 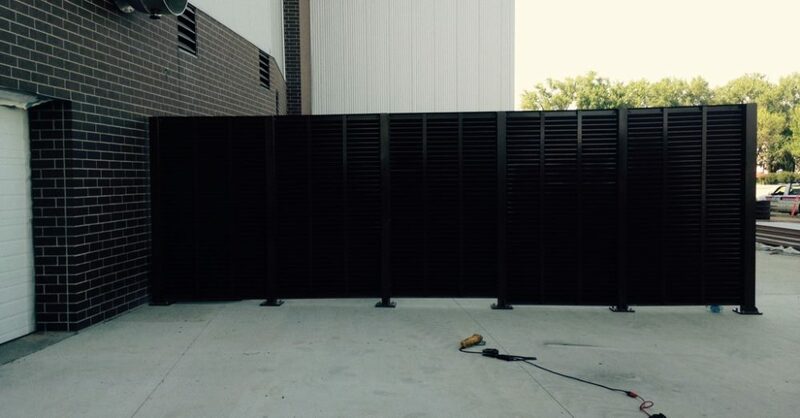 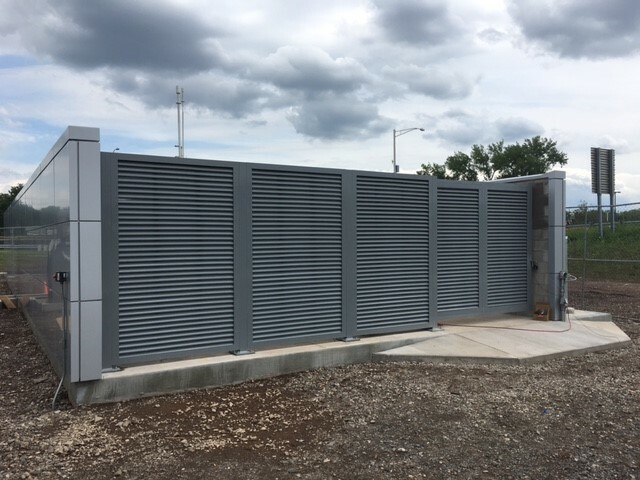 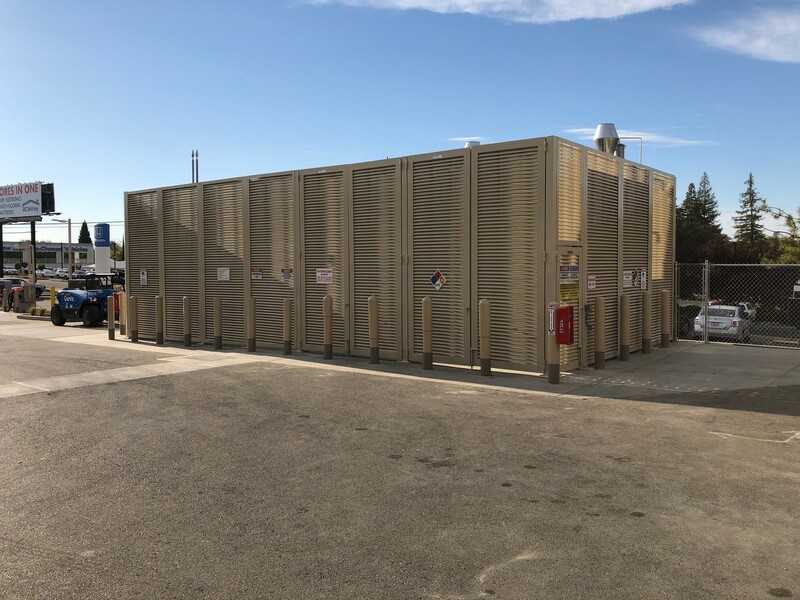 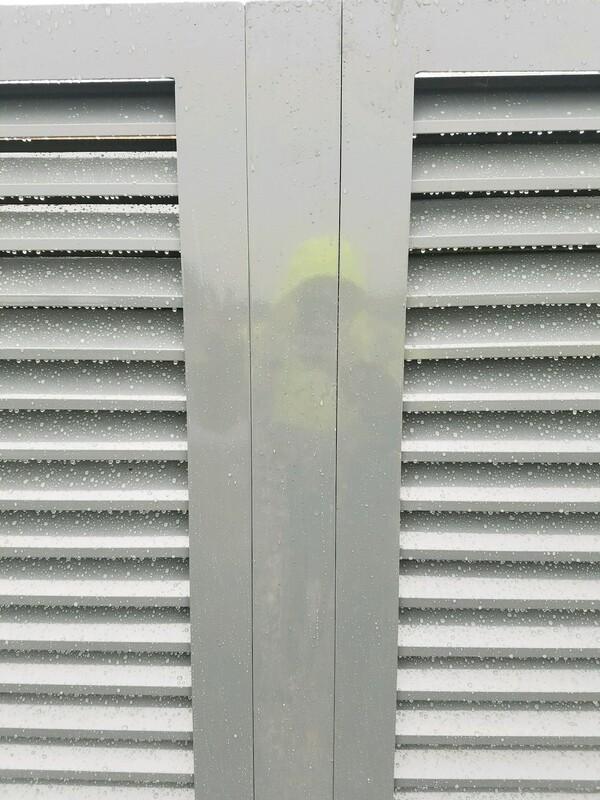 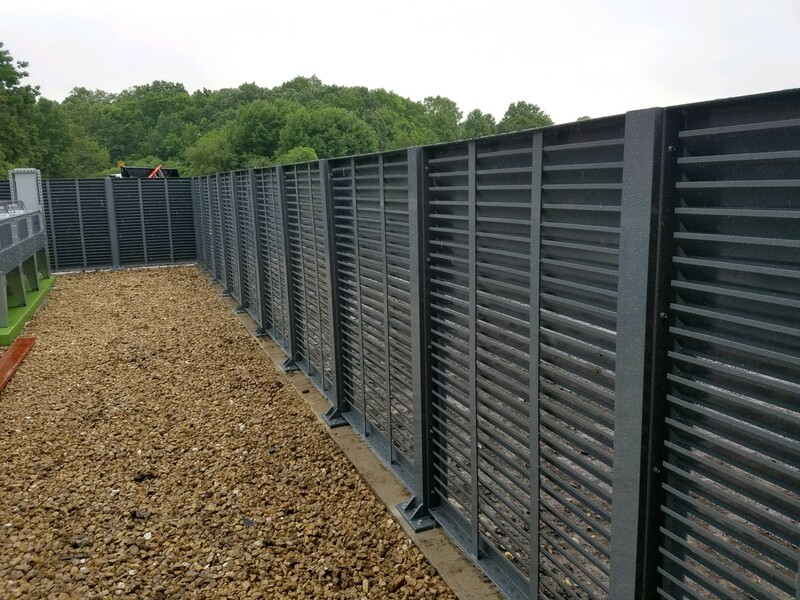 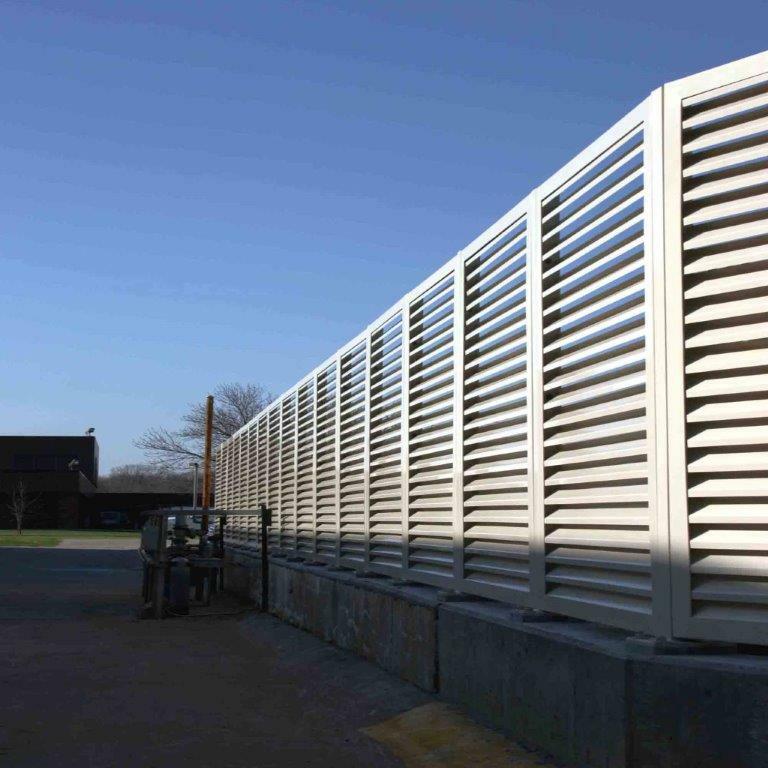 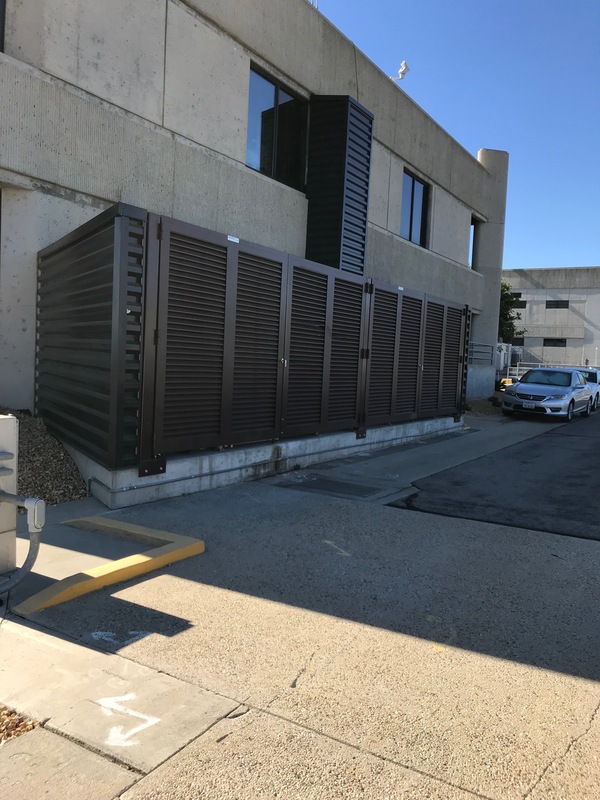 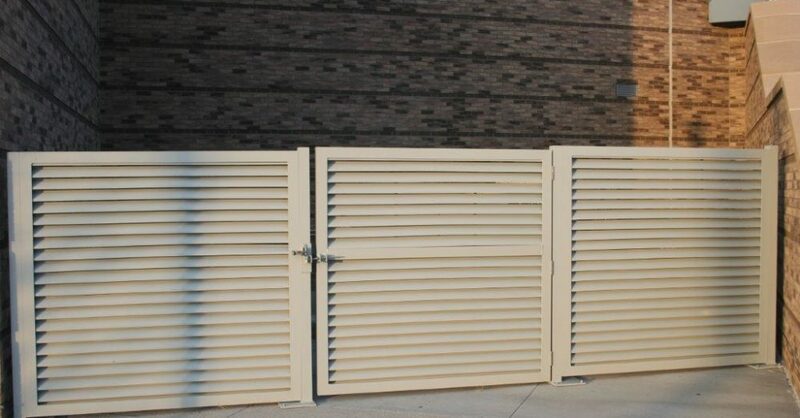 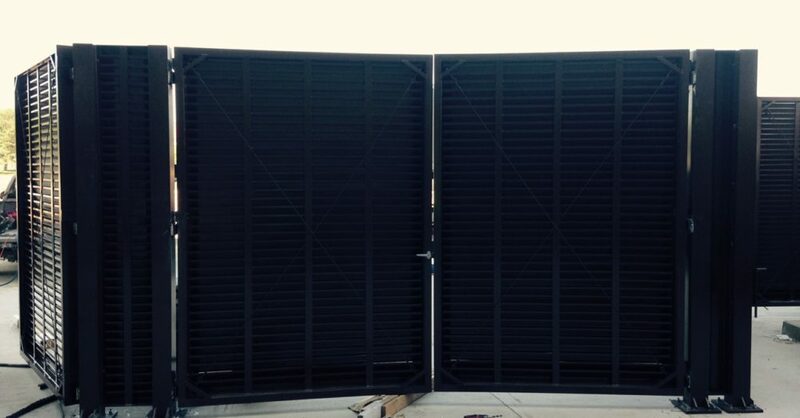 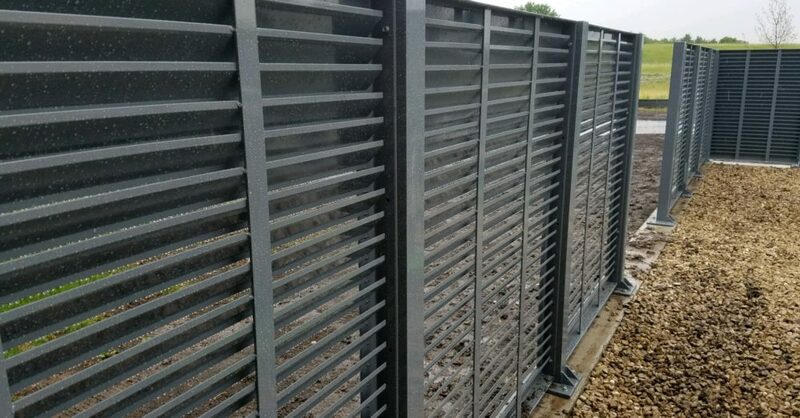 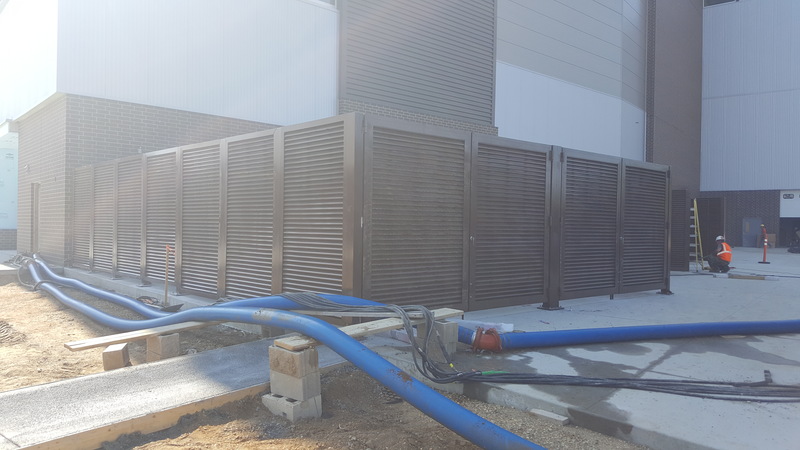 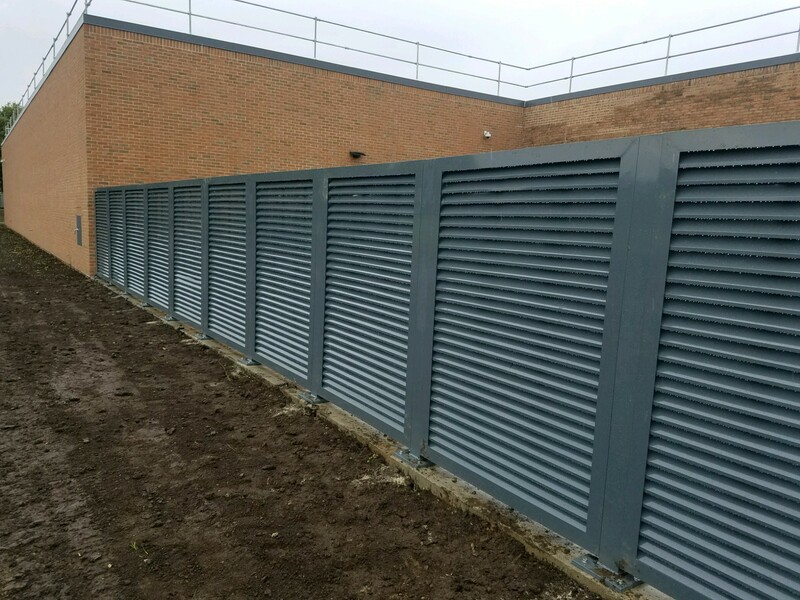 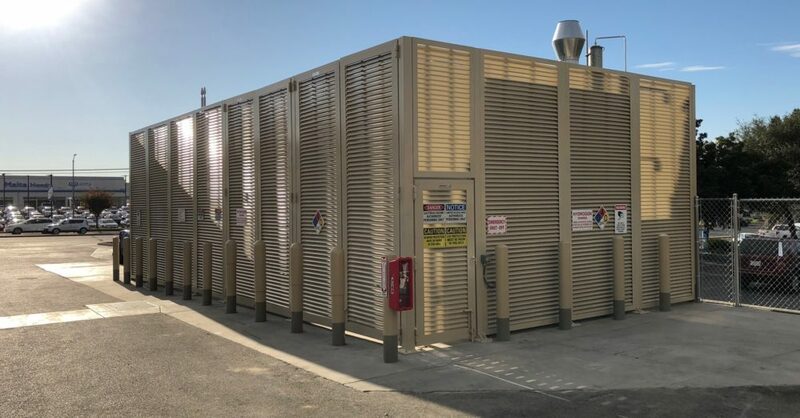 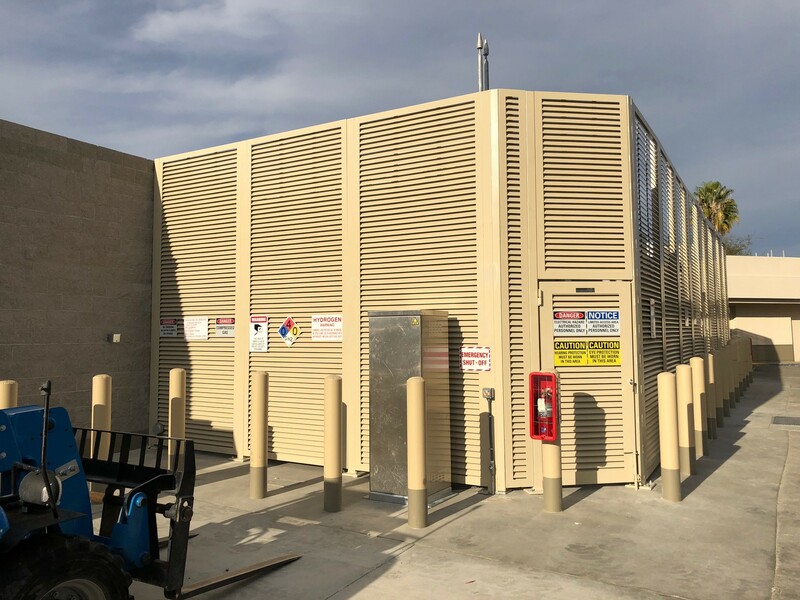 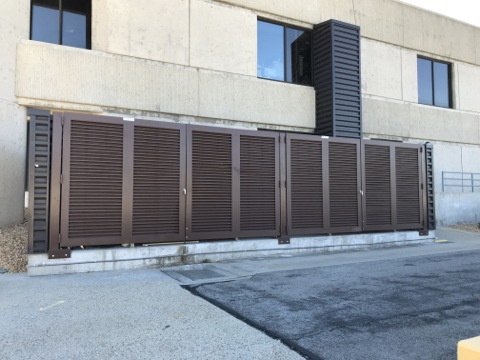 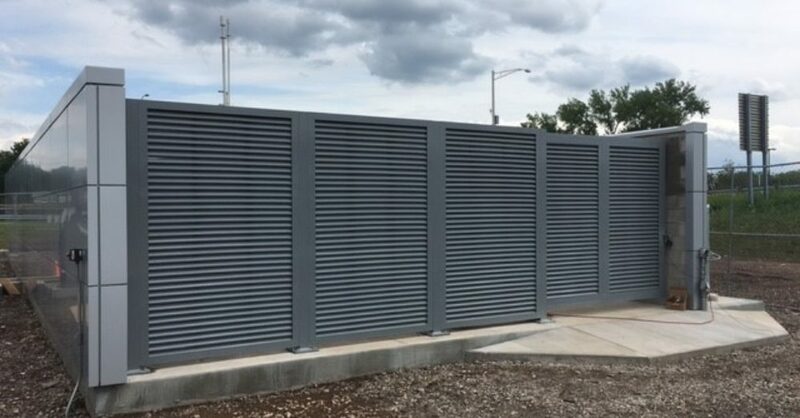 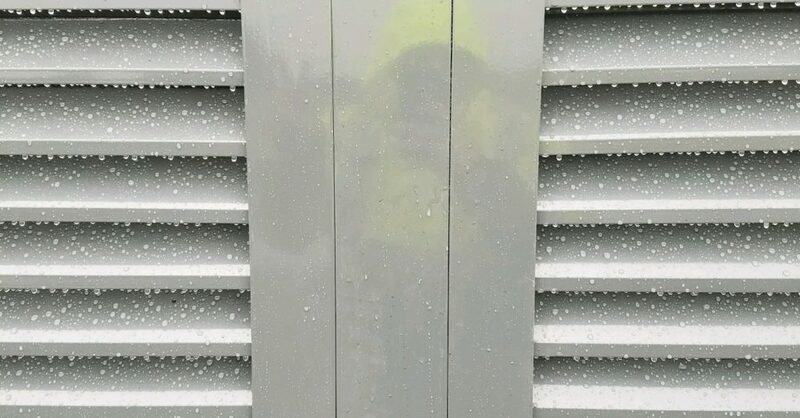 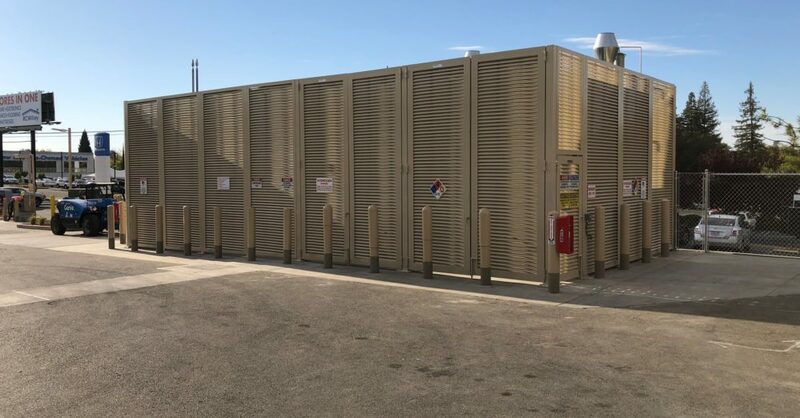 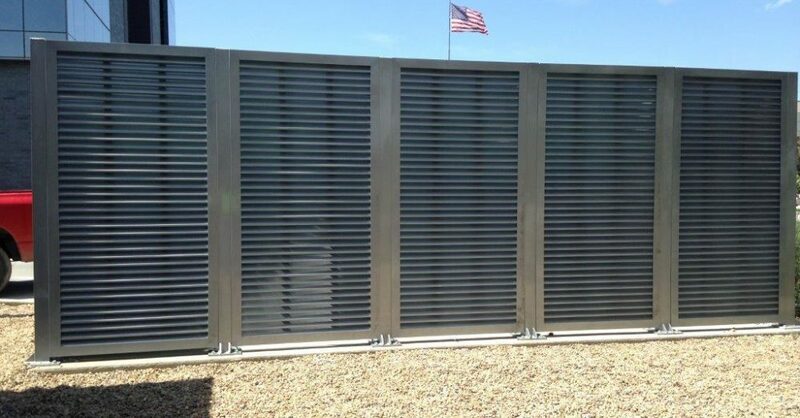 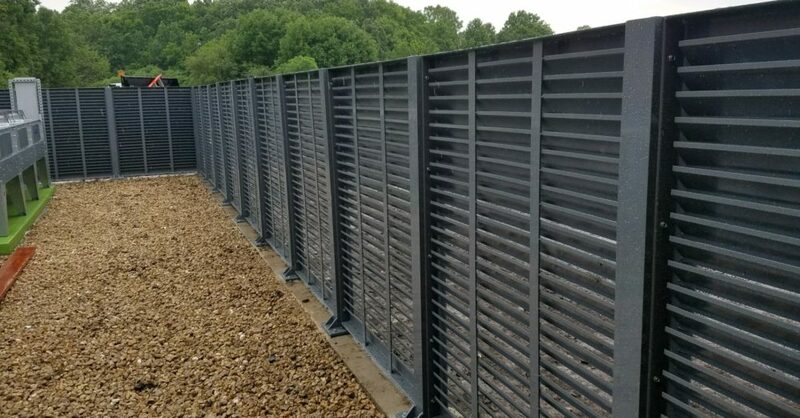 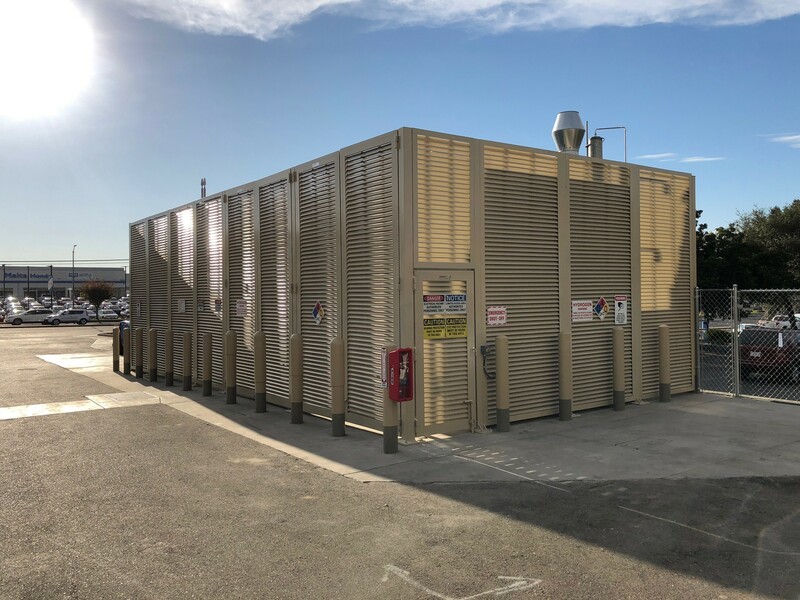 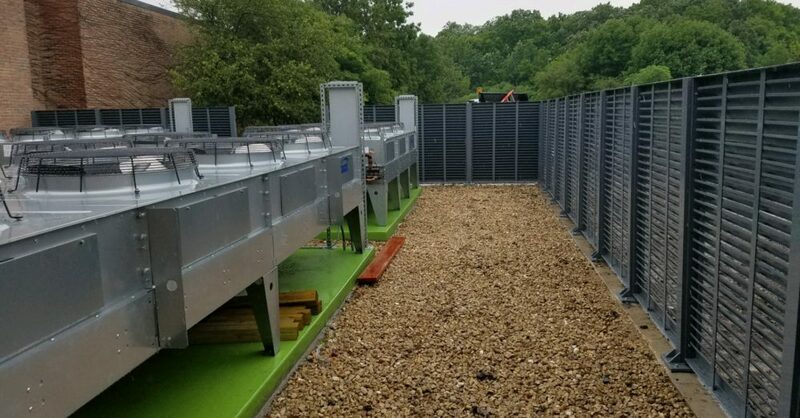 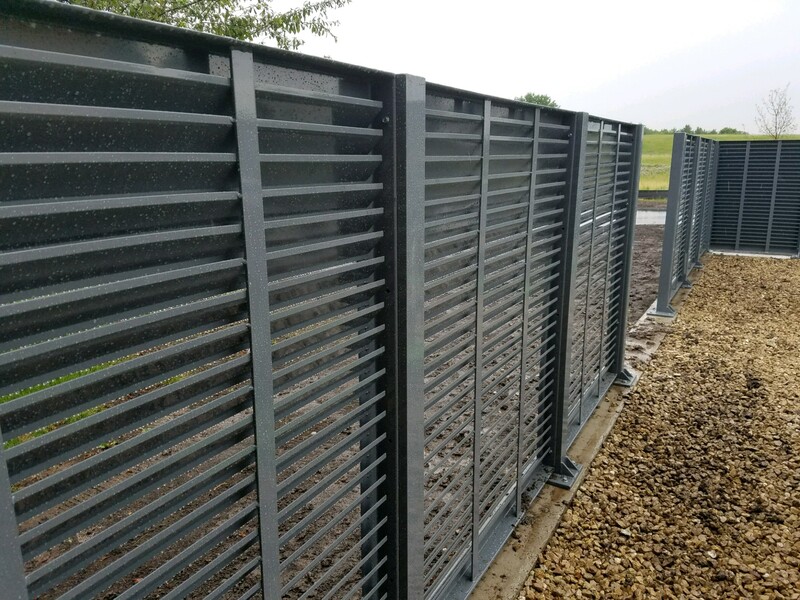 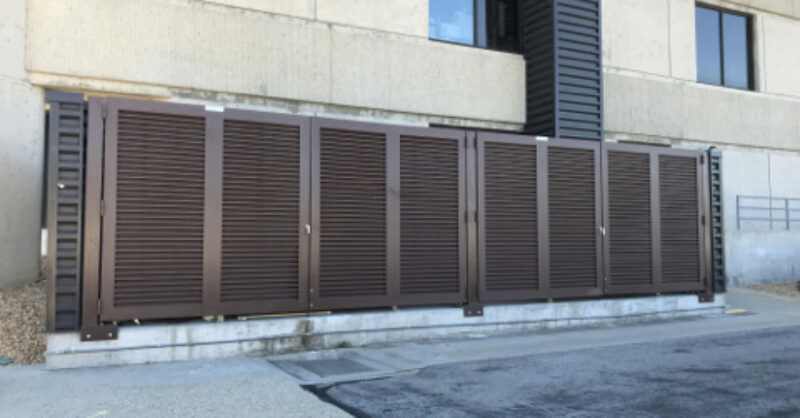 PalmSHIELD is the ultimate louvered screen wall Compressors, air handlers, chillers, generators, transformers, emergency equipment, pumps and meters all should be secured and concealed from public access. 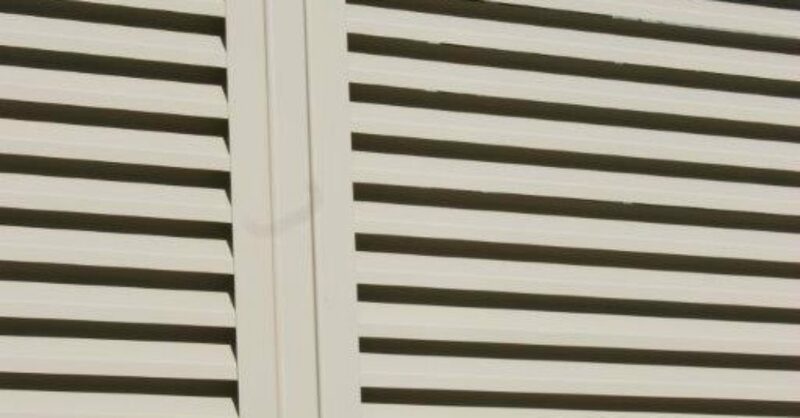 PalmSHIELD is your solution. 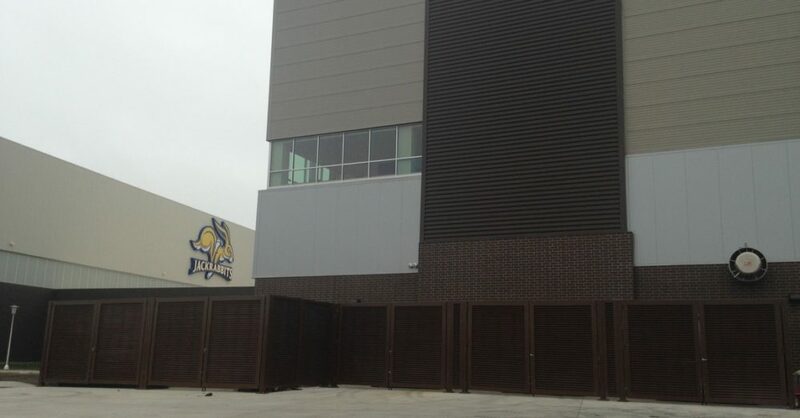 South Dakota State University. 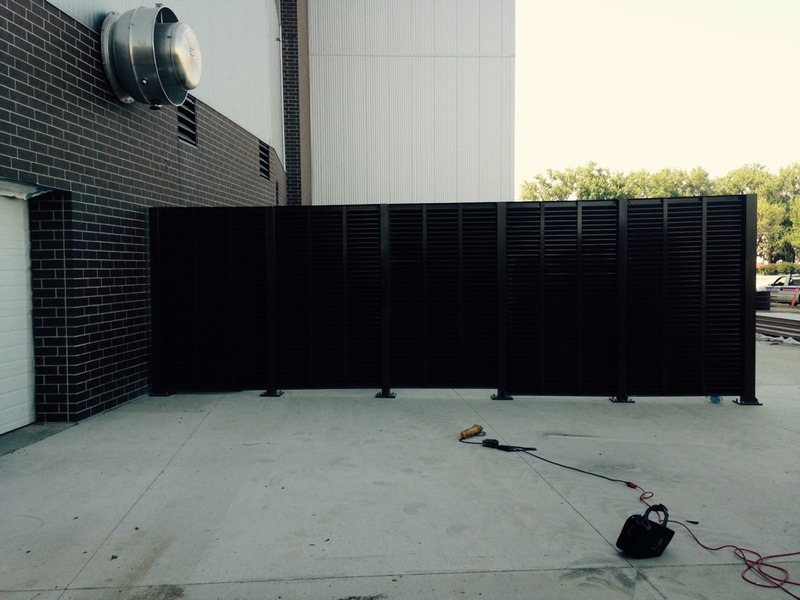 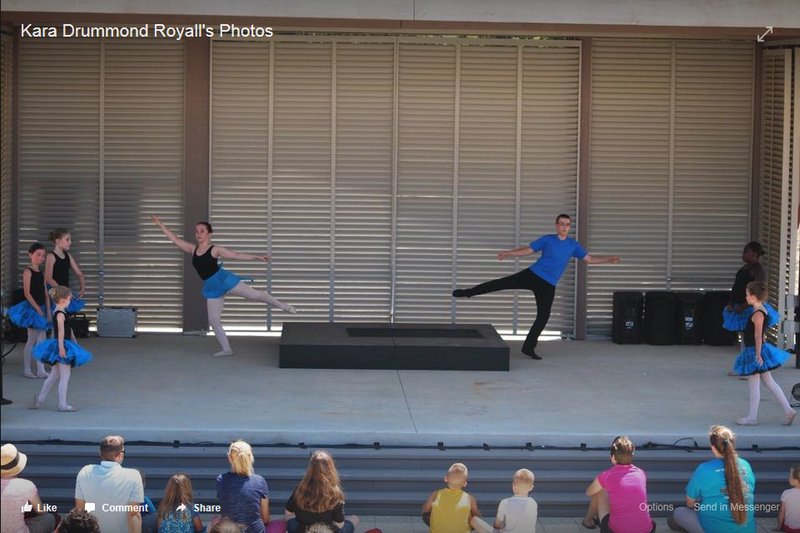 The Jack Rabbits received a new PalmSHIELD louvered mechanical screen system. 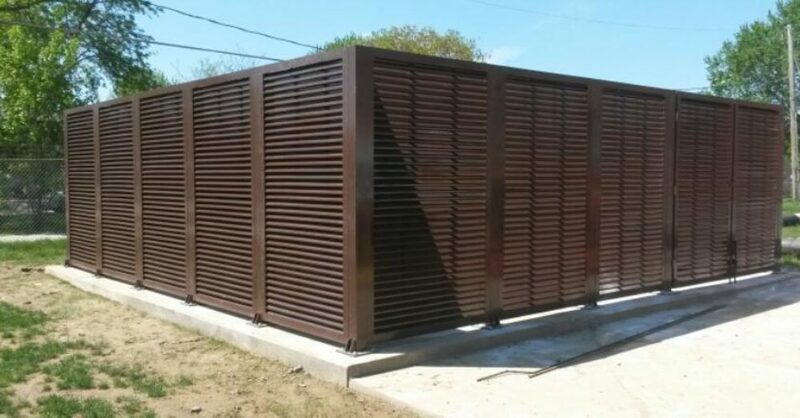 Love the chocolate brown. 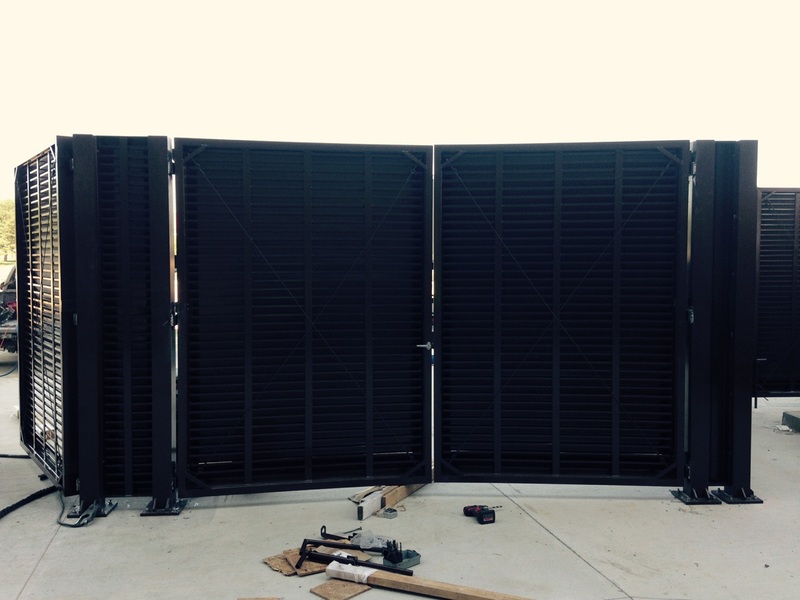 The Jack Rabbits' new PalmSHIELD louvered mechanical screen system.